What is World Vegan Month? Kicked off by World Vegan Day on November 1st, World Vegan Month is celebrated globally as a time recognizing how far the vegan movement has come, how accessible living plant-based and vegan can be, and as a time to encourage veg-curious to adopt or explore veganism further through trying new restaurants, recipes, and exploring ideas. It’s also a time to consider and acknowledge how beneficial this lifestyle can be to the environment, our communities, and the animals. The celebration of World Vegan Day began in 1994, in commemoration of the Vegan Society’s 50th Anniversary. The earliest practitioners of vegetarianism and veganism lived over 2,000 years ago, including Pythagoras of Samos and the Buddha. By the time David Watson died at age 95 in 2005, there were 250,000 self-identifying vegans in Britain and 2 million in the U.S.
Today, veganism continues to spread. 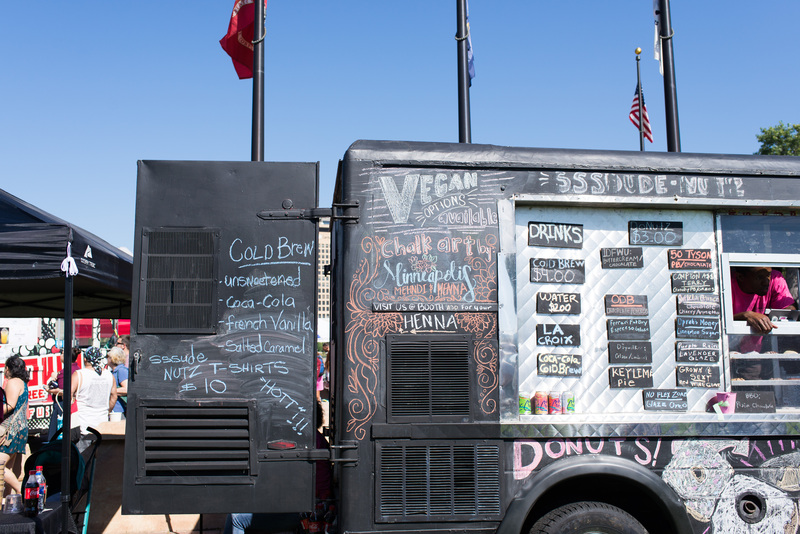 As of 2017, six percent of Americans identify as vegan (that’s roughly 16 million people). Compared to one percent in 2014, that’s a huge growth! 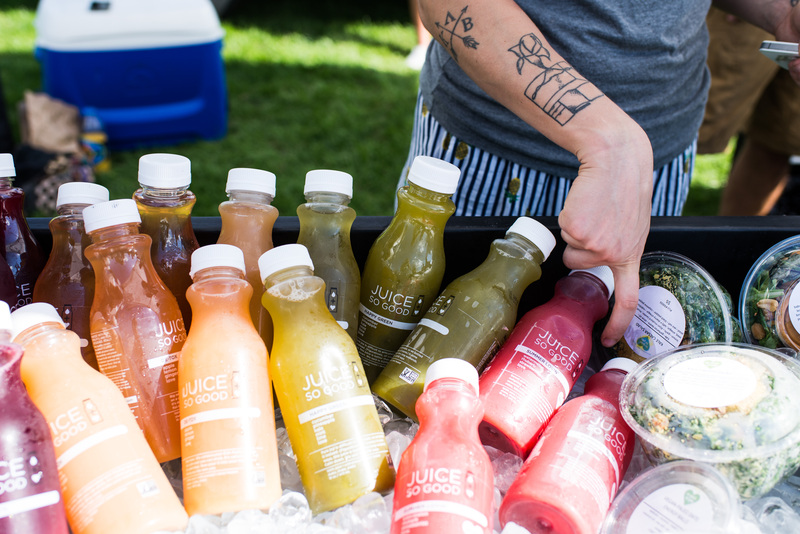 The number of plant-based options available in the market is also increasing dramatically. On November 1st, 2018, over 3,000 vegan activists marched for animal rights in Hamburg, Germany. The activists formed a human chain around the inner Alster lake in the city center before marching through the city center, making the longest human chain for animal rights ever formed. The event was likely the biggest animal rights event in Hamburg and possibly Germany to date. 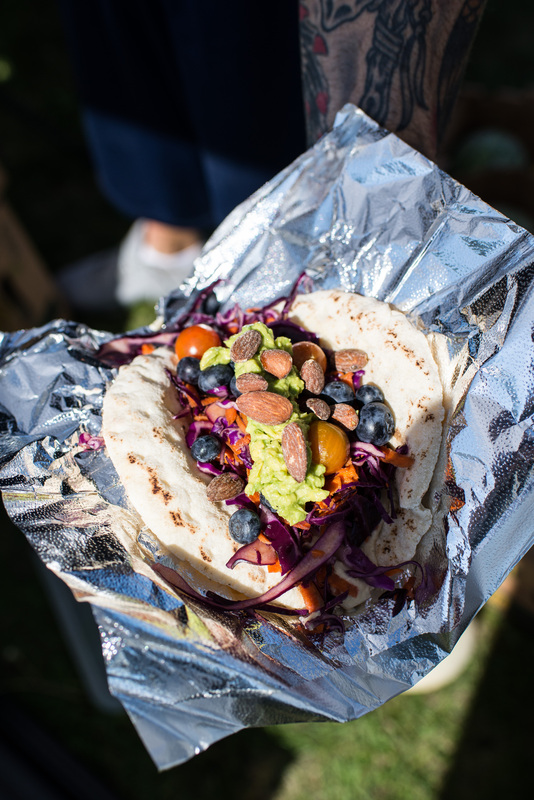 See the list The Vegan Society is keeping on their website of vegan celebrations happening around the world. How can I celebrate World Vegan Month? Incorporate more plant-based foods into your diet! Try out a new recipe for lentil chili, pumpkin mac and cheeze, or create one of your own! Have a plant-based potluck with friends and mark your calendars for our 16th Annual Vegan Thanksgiving Potluck on December 1. 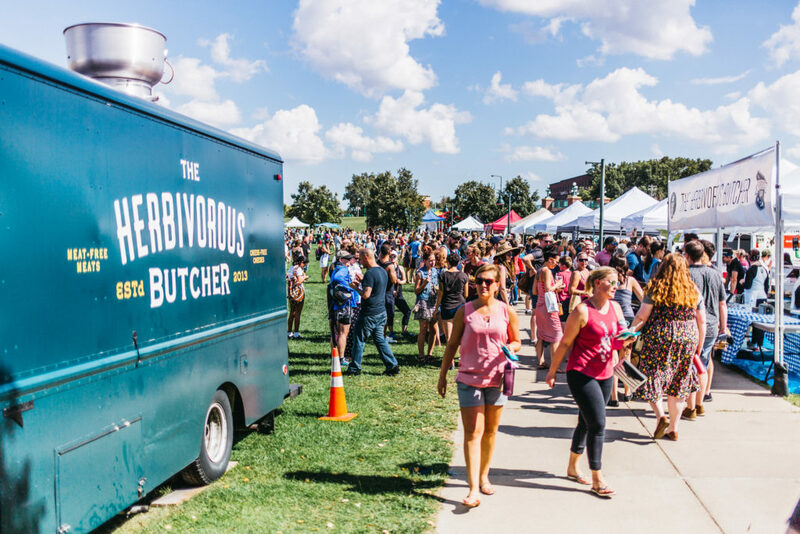 If you’re working on reducing or limiting your own animal product intake, try out a plant-based analog to dairy or meat––there are a number of awesome makers of vegan cheeses and meat-free meats today, including our local The Herbivorous Butcher and Punk Rawk Labs. You could even try some tempeh by Tempeh Tantrum! 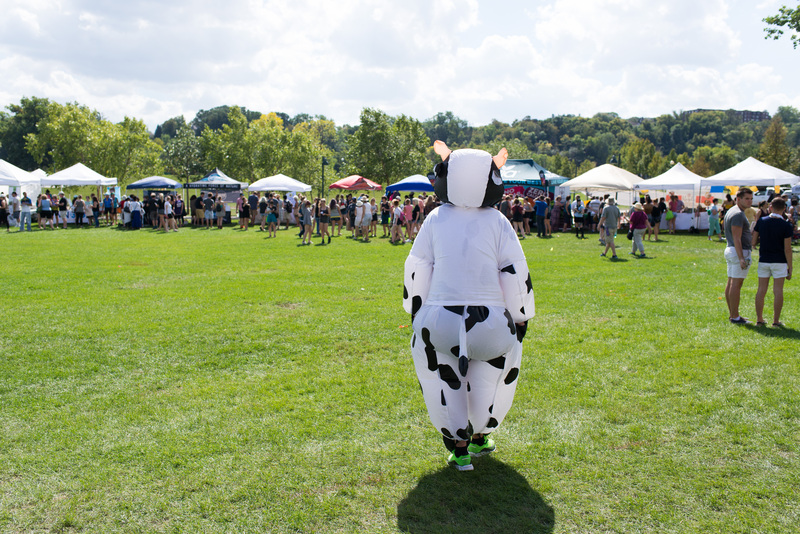 Connect with those most impacted by the farming industrial complex by visiting a farm sanctuary. 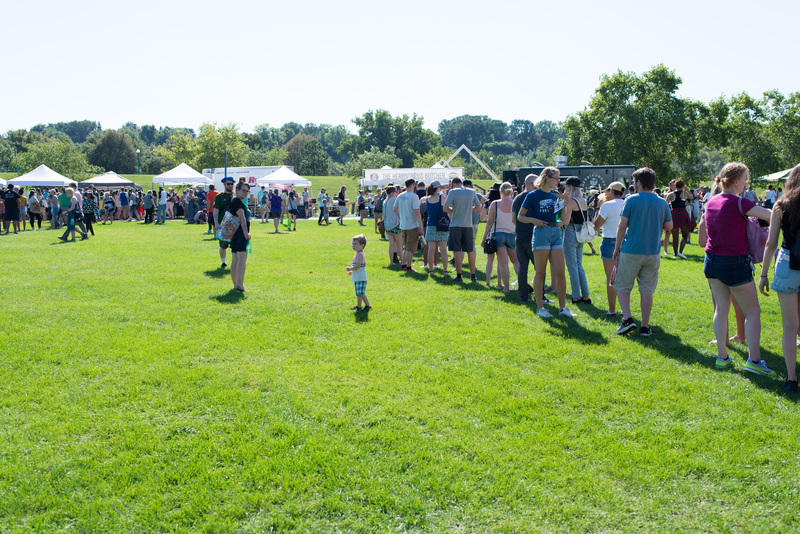 We’re lucky to have a number of sanctuaries local to the Twin Cities doing important rehabilitative and educational work, including Farmaste Animal Sanctuary, Spring Farm Sanctuary, Rooster Redemption, SoulSpace Farm Sanctuary, and more. Watch a documentary with friends! There are so many documentaries out there today covering topics like our societal dependency on consuming animals, the health impacts of a plant-based diet, and the environmental impact of our consumer tendencies, including The End of Meat, Cowspiracy, Earthlings, and Forks Over Knives. Share your story of compassion and change with us this season! Raise awareness. Lend a book on plant-based living to a friend or leave a few leaflets or a magazine in a public waiting room. You never know who might pick it up! Download the VeGuide app, developed by the Vegan Society to get you started (or to continue) on your vegan journey! 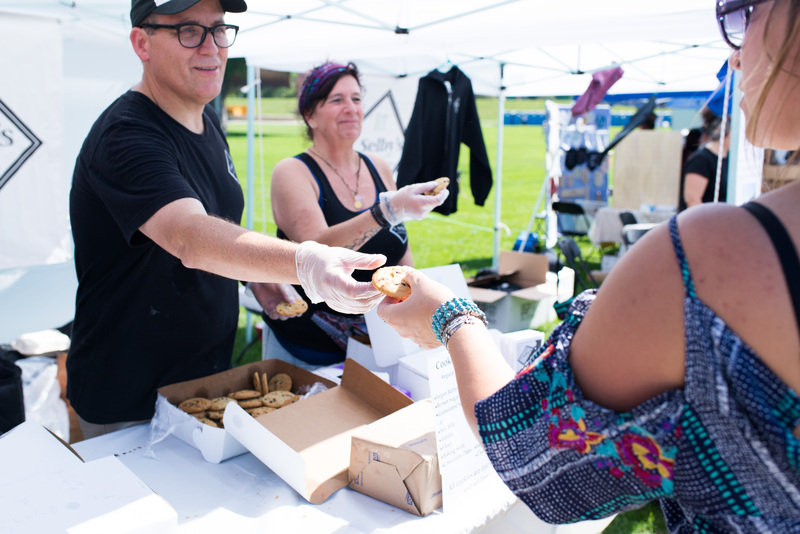 Support local, plant-based, Twin Cities businesses! 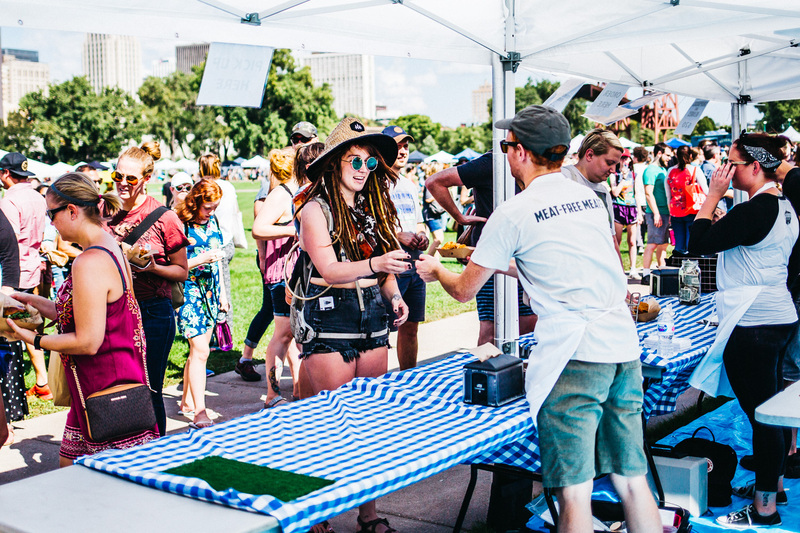 One great way to get to know the Twin Cities vegan scene and celebrate fall is coming up this Sunday––come to the Plant Based Showcase at Lake Monster Brewing! 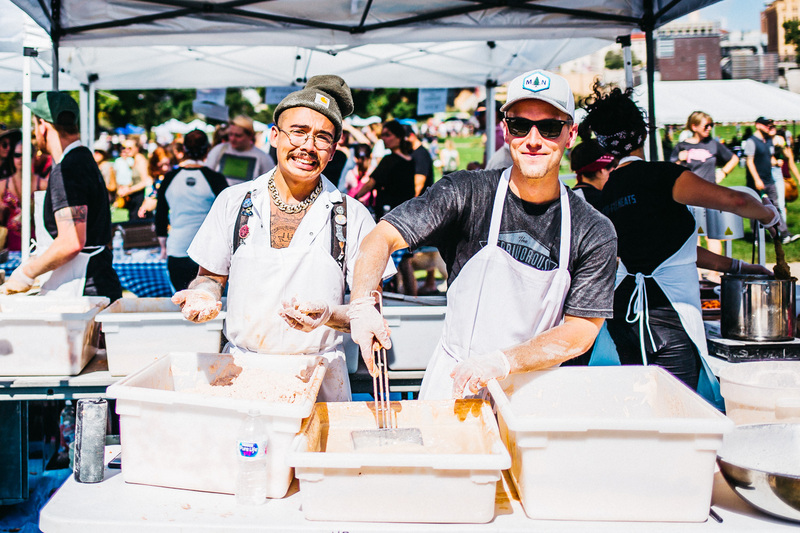 Read more about the vendors on our blog. You may have met Abraham Rowe at one of our events or on our blog. 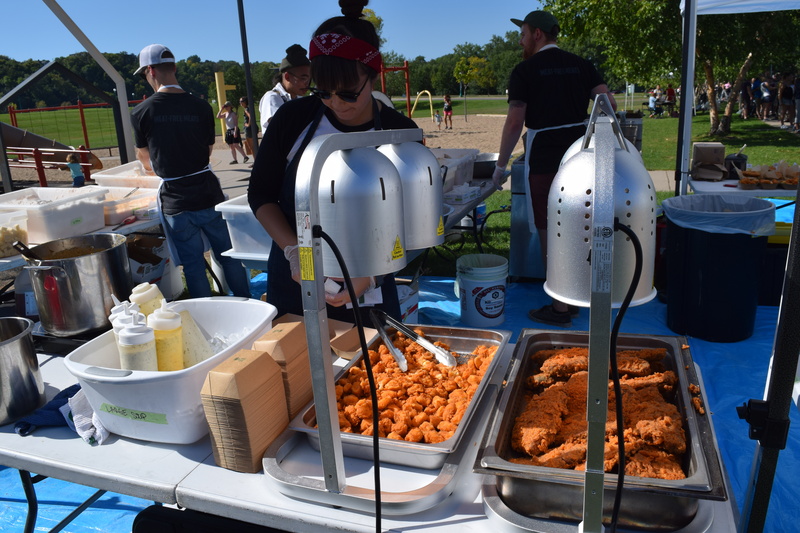 Since 2016, Abraham has been heavily involved with CAA, volunteering at our annual banquet, our chili cookoff, postering, potlucks, town halls, Twin Cities Pride, pay-per-view video outreach, food giveaways, and more. In April 2017, he joined our board and then became Board President. 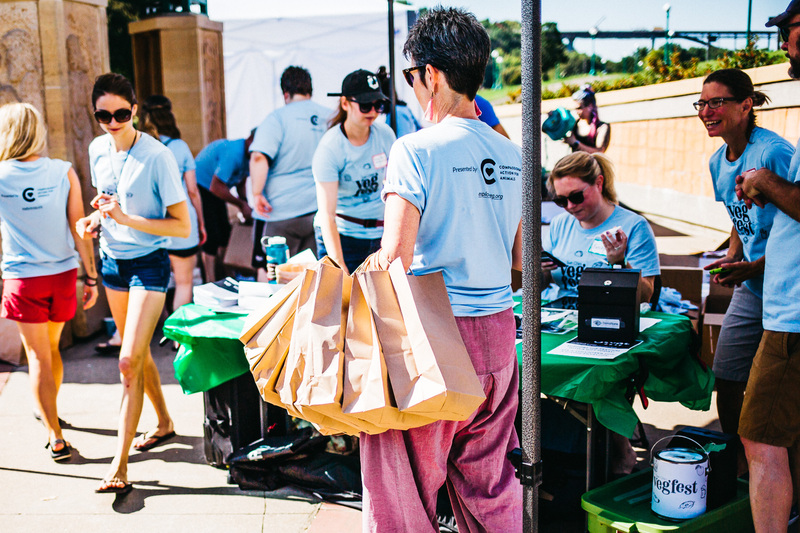 Throughout his time with CAA, he’s had a chance to see the many faces of outreach and impact CAA has on the Twin Cities community. He’s also helped shape our work. This November, Abraham will move to New York City for his work with Mercy For Animals. He will, however, continue to be involved with CAA. 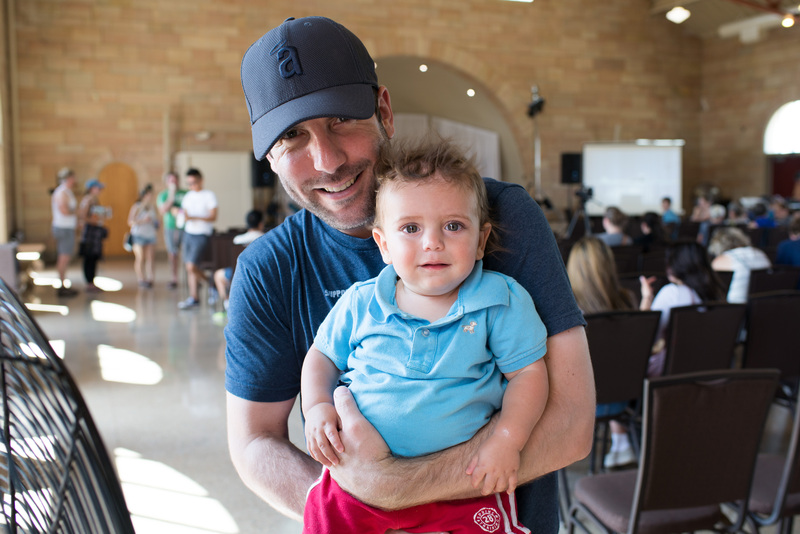 Abraham runs Mercy for Animals’ US and Canadian Corporate Campaigns Program. 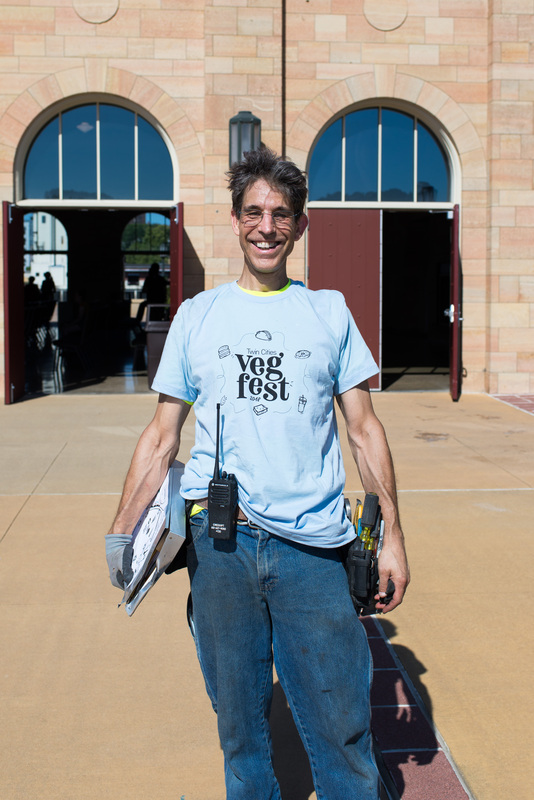 His work focuses on getting restaurant companies to adopt animal welfare policies in their animal supply chains to ban cruel practices used on farmed animals. “The reality is that corporations have the power over the lives of hundreds of millions of animals and an individual company choosing how to source its animal products can completely change the lives of these animals and reduce their suffering and that’s really important to me. It’s not the end goal, but it’s also important to do what we can in the meantime for these animals,” said Abraham. Animal rights groups noticed that they were targeting corporations individually with separate campaigns throughout the 90s and early 2000s with little action on the corporations’ part. Personal or consumer boycotts as well as larger campaigns targeting corporations add up to massive collective change for the lives of animals. 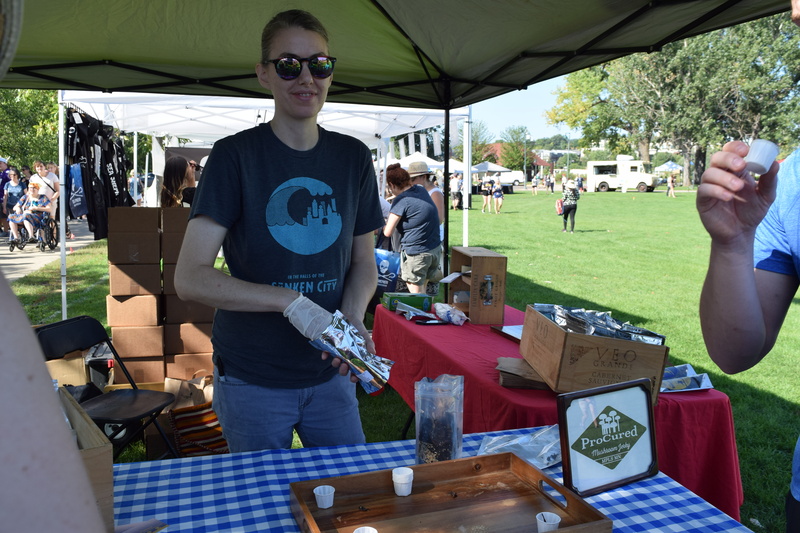 “It’s incredibly important to support local community animal advocacy groups like CAA that are interested in nonviolence and are meeting people where they’re at, being compassionate and kind towards others, and demonstrating that this is an accessible, cheap, and pleasant lifestyle,” says Abraham. Abraham plans to visit the Twin Cities regularly and will continue being involved with the CAA Board. 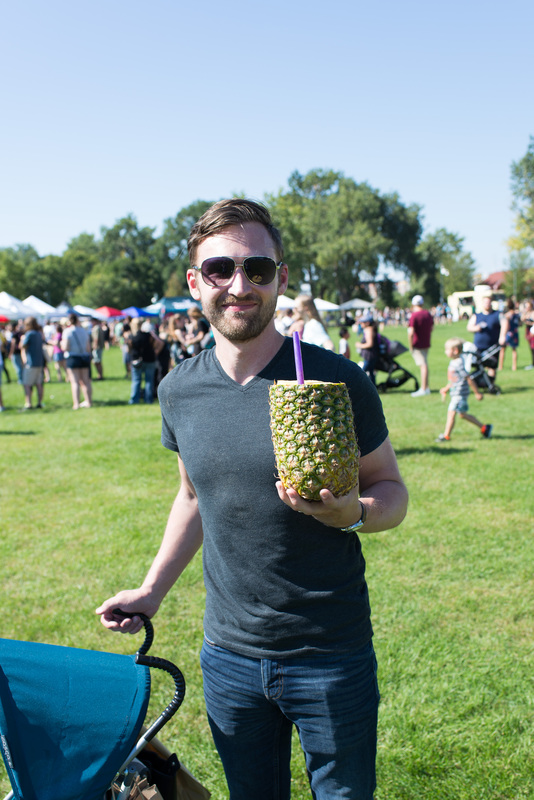 He’s looking forward to learning more about the NYC vegan scene and trying out new restaurants, but he’ll miss the Twin Cities scene as well, including May Day Café, Muddy Waters, The Herbivorous Butcher, and On’s Thai Kitchen. We’re so glad to have Abraham on our board of directors and look forward to seeing how his work in animal advocacy shapes a kinder, happier future for farmed animals. Are you interested in becoming a member of our board of directors? For more information, contact Laura Matanah at laura@exploreveg.org. 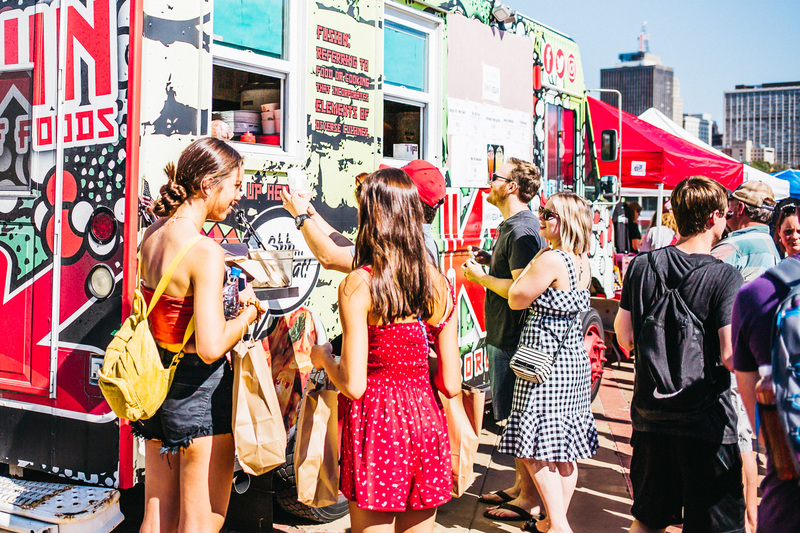 Looking for one more opportunity to feast on plant-based food truck eats before winter comes? Mark your calendars for Sunday, November 11, 1:00 – 5:00pm for the first ever Plant Based Showcase at Lake Monster Brewing. 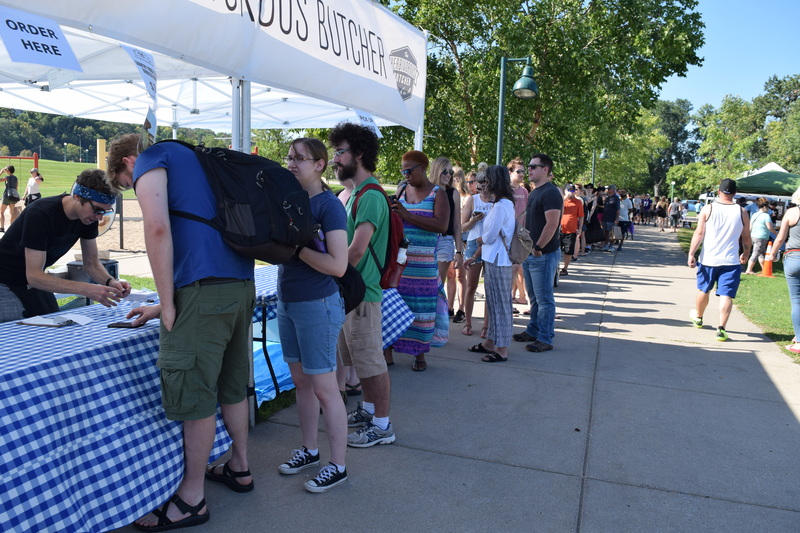 It’ll be like a mini Twin Cities Veg Fest! 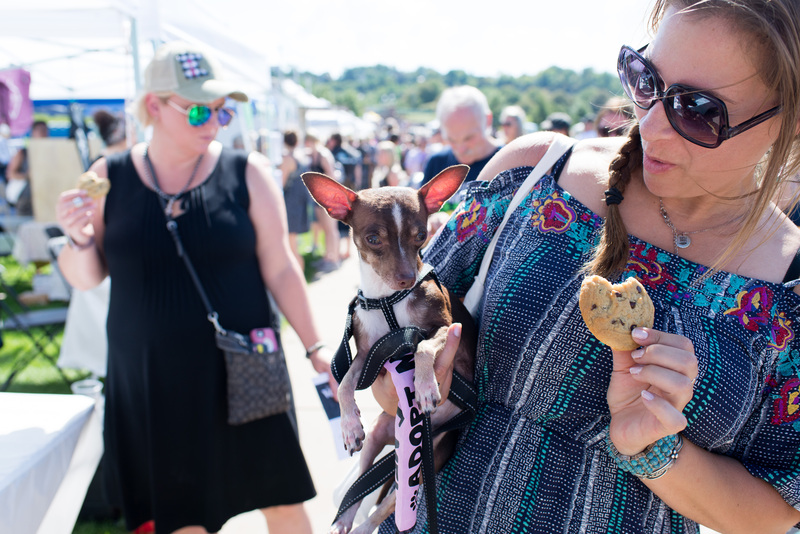 Featuring food vendors and other plant-based entrepreneurs at Lake Monster Brewing, this event is for all––veg and veg-curious. 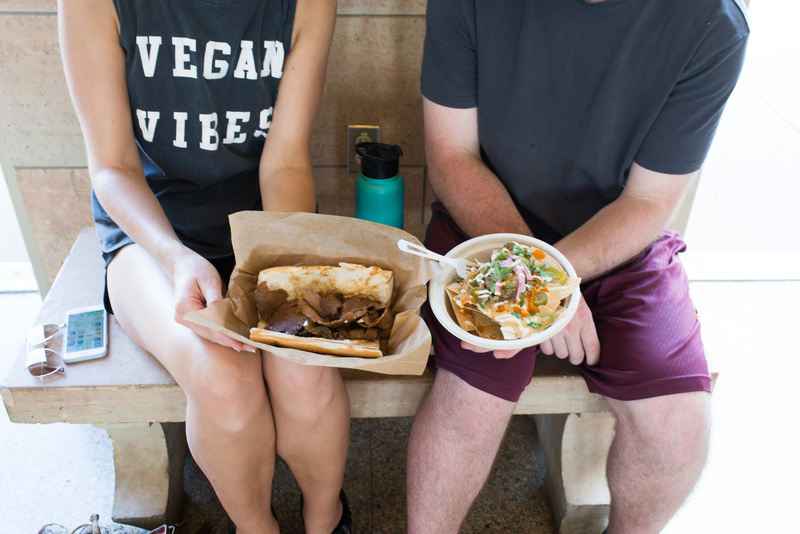 All three vegan Twin Cities food trucks (Reverie Cafe + Bar, The Herbivorous Butcher Food Truck, and The J. Mobile) will be there to satisfy your sweet, savory, and possibly even your breakfast tooth before going off to their deep winter slumber. 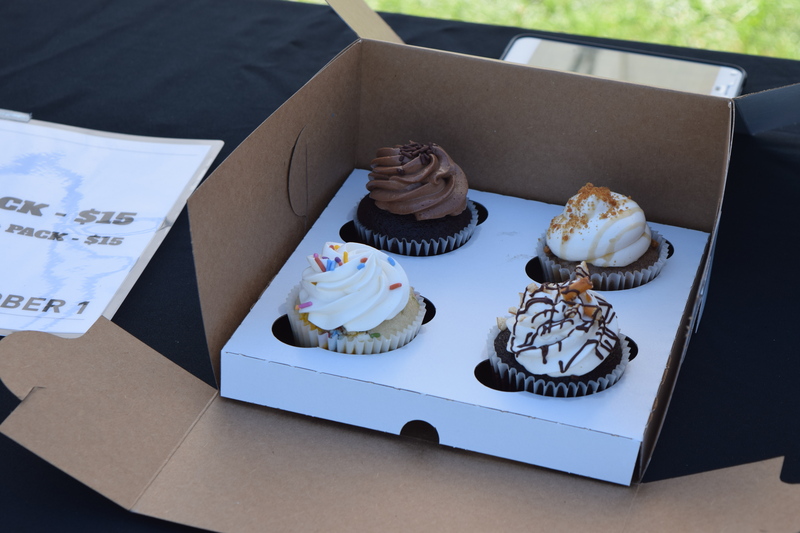 Coconut Whisk Baking Co. creates simple and clean vegan, gluten-free, and allergen-friendly baking mixes. 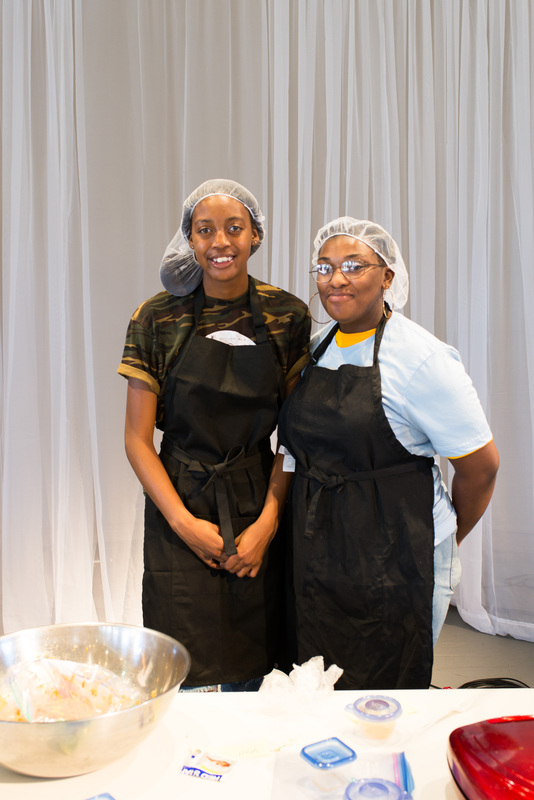 Their core beliefs that food connects people, that no one should miss out due to allergies or lifestyle choices, and supporting and giving back to the voiceless is what powers their sweet mission. Crepe & Spoon is a vegan ice cream and crepe shop in Northeast Minneapolis. 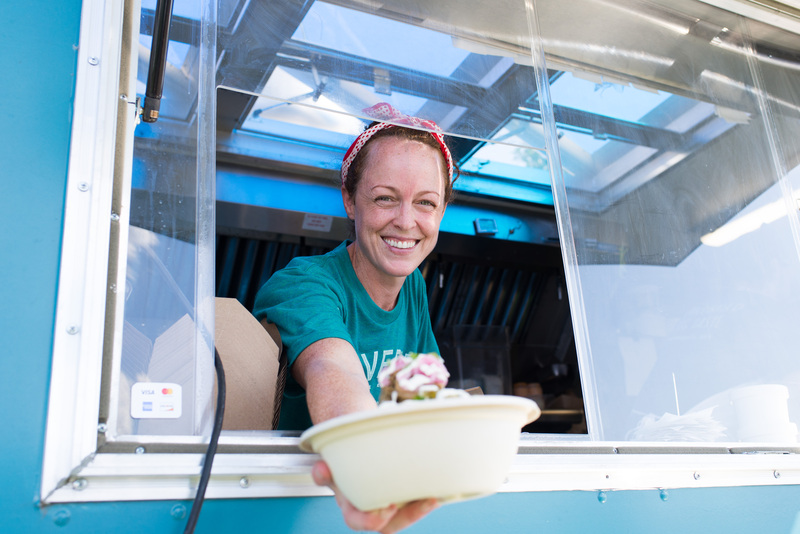 They design seasonally-inspired savory crepes and sweet dessert crepes alongside a rotating selection of handcrafted ice cream, relying on high-quality and local ingredients. Ethique Nouveau is a Minneapolis-based boutique dedicated to providing their customers with unique, high-quality designer products that do not rely on animal testing, ingredients, skins, or furs. Kelska Blu is an online vegan boutique that carries natural, handmade, vegan, and cruelty-free home goods, bath and body, skincare, hair care, and accessories. 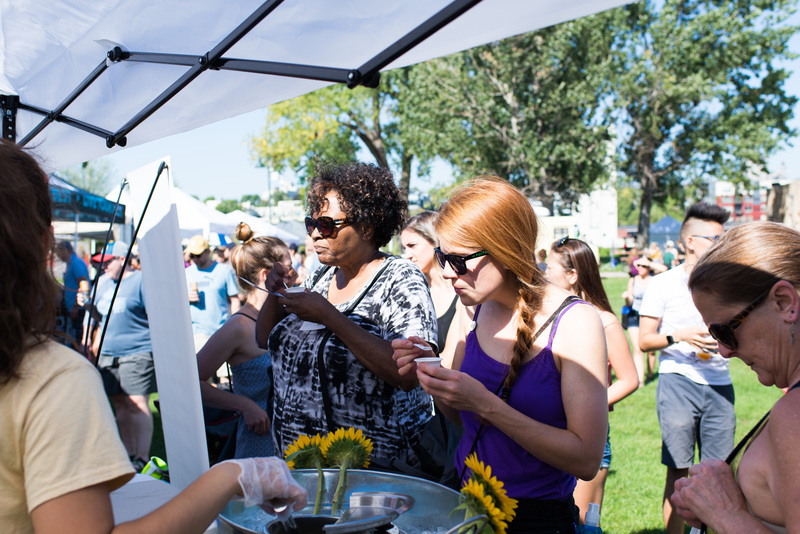 Noble Soap Gallery is a maker of all natural, sustainable, handmade vegan soap based in NE Minneapolis. 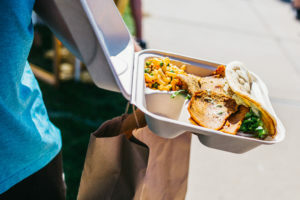 They are committed to reducing their carbon footprint, offering free bicycle delivery to anyone in Minneapolis and using biodegradable labels and packaging. PLNT BSD creates comfortable and stylish apparel using vegan materials and ink that is not tested on animals. 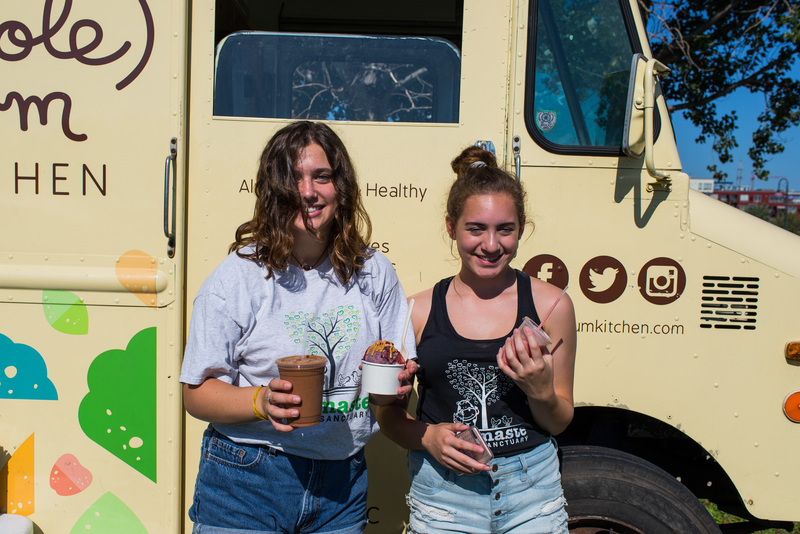 Their aim is to start more conversations about the benefits of a plant-based diet and lifestyle by spreading their positive messaging. 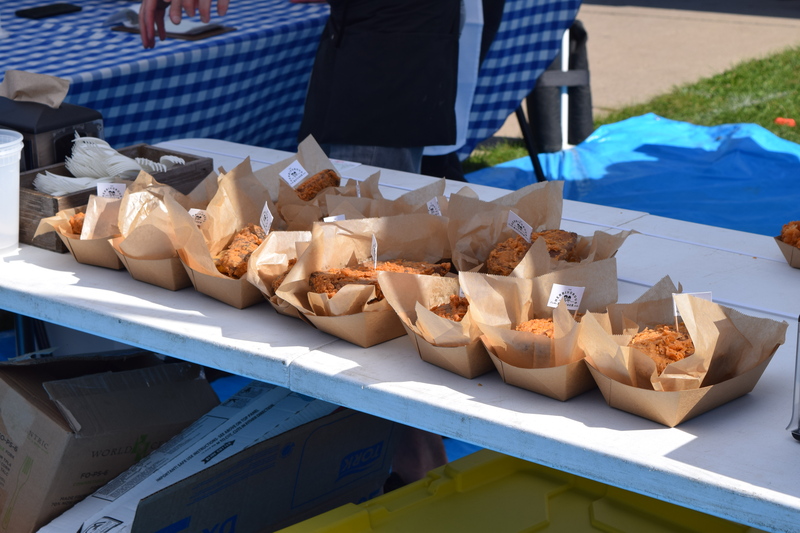 Prairie Vegan Pies focuses on pies, but they also fulfill custom orders for cakes, cheesecakes, tarts, and cookies. 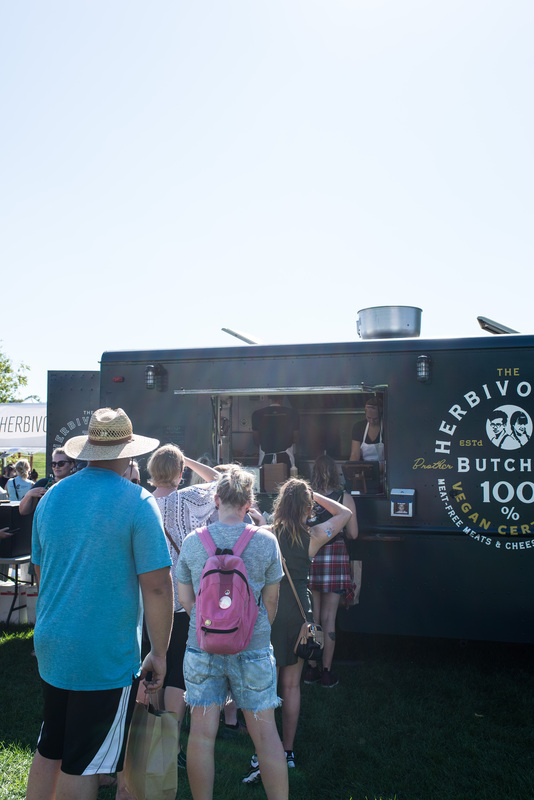 Everything is made from scratch and is 100% vegan! Rawr Organics created the Rawr Bar, the ultimate vegan, paleo-friendly bar with a mission to support and feed starving children. Made with eight high quality, organic ingredients, this protein-packed bar will keep you fueled and satisfied throughout the day. 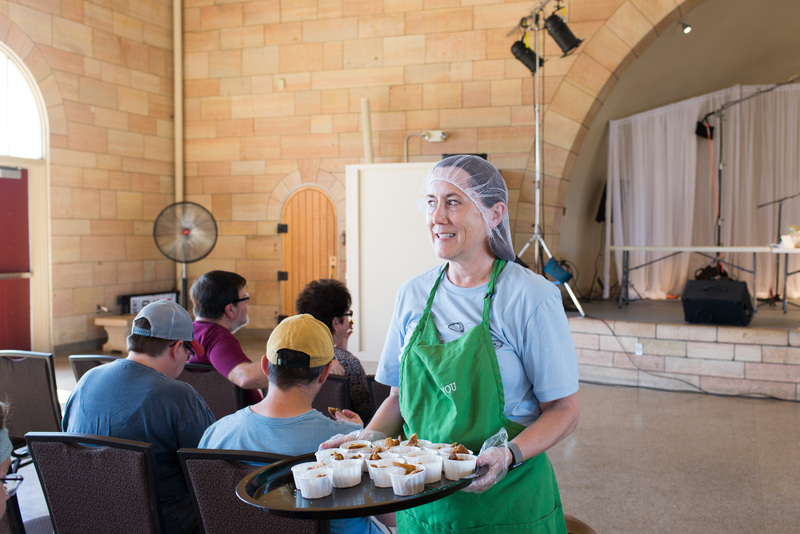 Robin Asbell is a plant-based chef, author, and instructor located in the Minneapolis area. 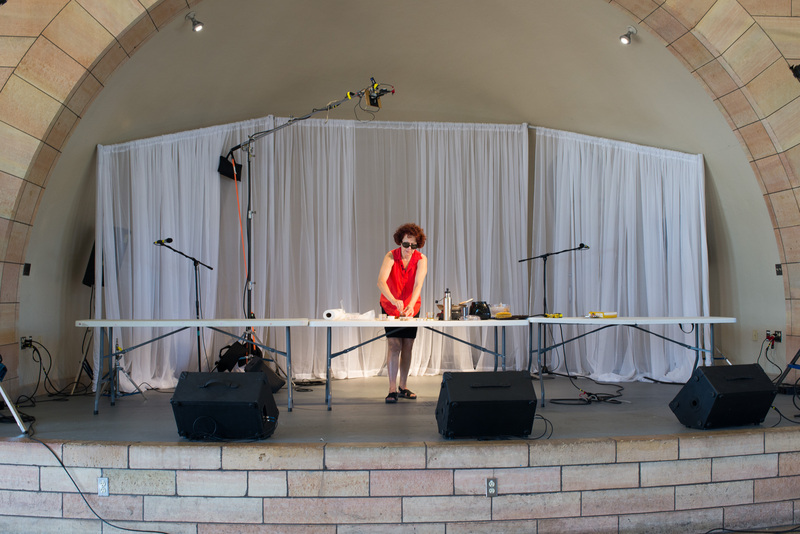 She has authored eight books and speaks about whole grains and eating well to various groups throughout the year. 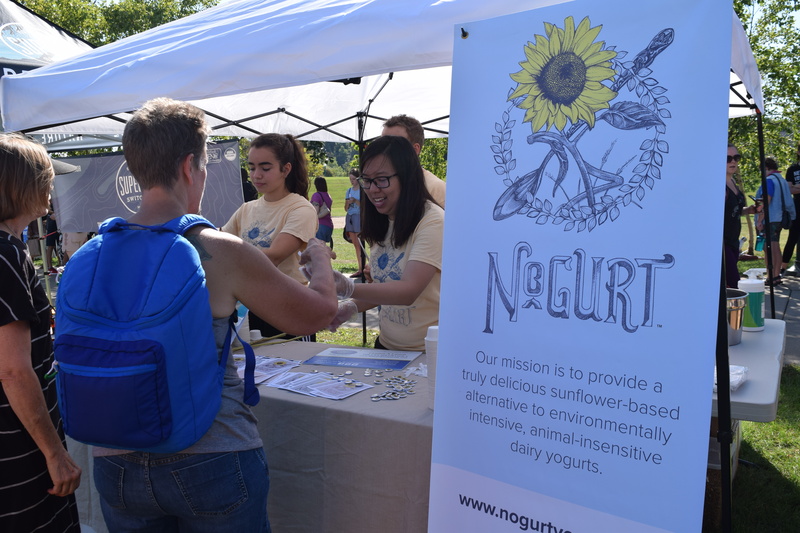 Sweet Root Mpls creates dairy-free and vegan desserts, focusing on using organic, fair trade, non-GMO, natural ingredients, and food dyes whenever possible. 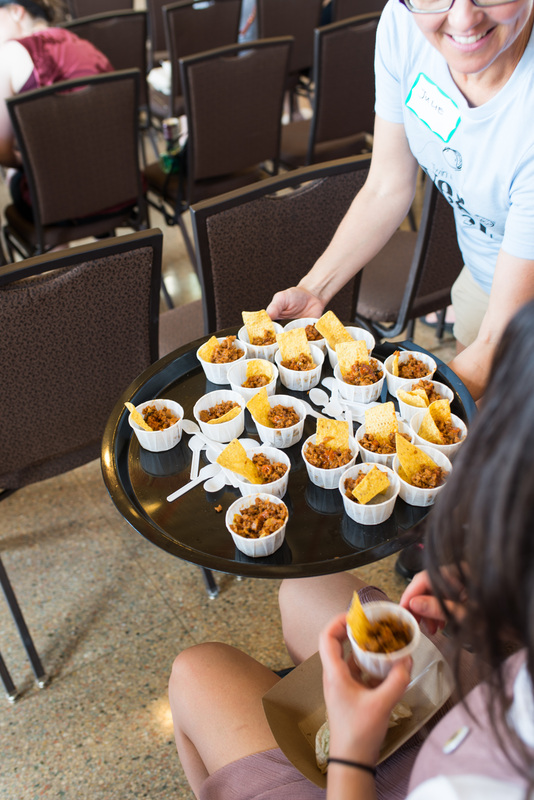 Tempeh Tantrum hand makes fresh East Javanese-style tempeh in small batches for the Twin Cities and beyond. 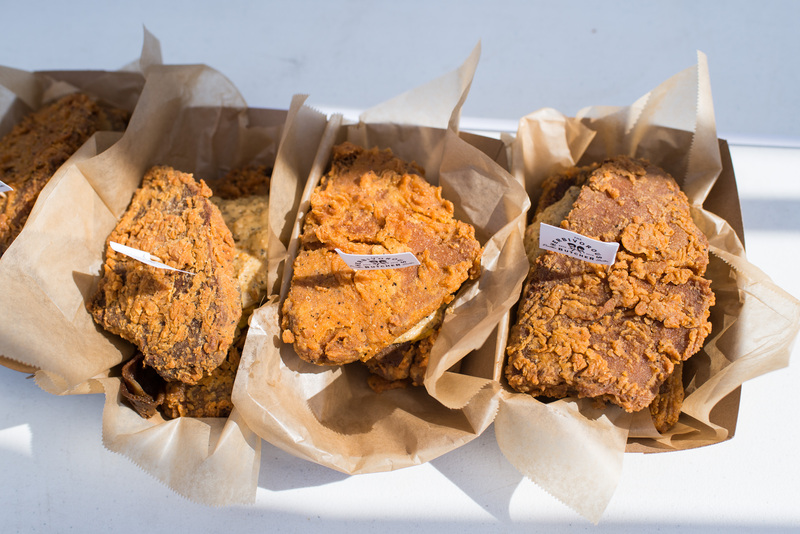 Starting with local organic soybeans, they culture them and follow a customized fermentation process that transforms the soybeans into a firm, savory cake that can be cooked in a variety of ways. 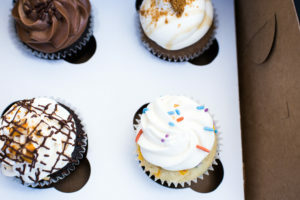 Vegan East creates vegan cakes, cupcakes, cookies, muffins, quiche, rolls, and cheesecakes, with several gluten-free options. They have locations in uptown Minneapolis and downtown White Bear Lake. 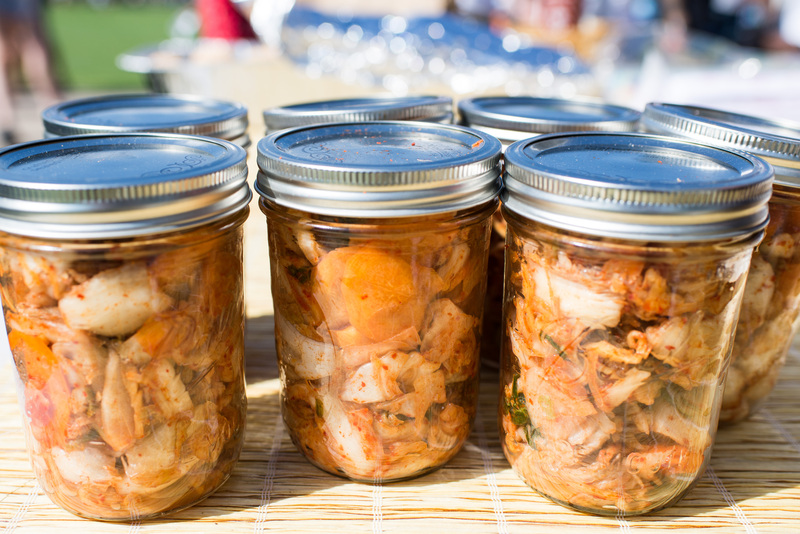 The Plant Based Showcase will take place rain or snow and is zero-waste. Lake Monster has plenty of space to keep you warm and dry. 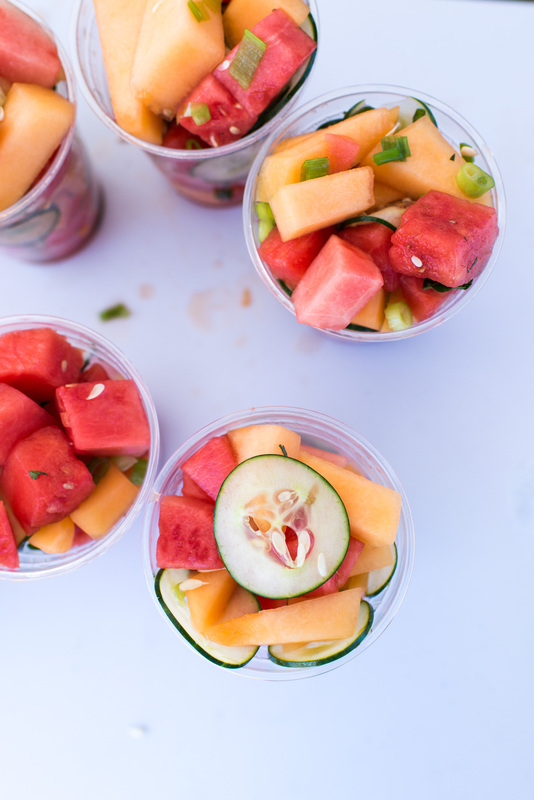 We encourage you to bring your own utensils and reusable napkins. Lake Monster Brewing has a parking lot and overflow street parking. The majority of their beer is vegan, except for their Murmur Milk Stout, Raspberry Berliner, and Sour Red. 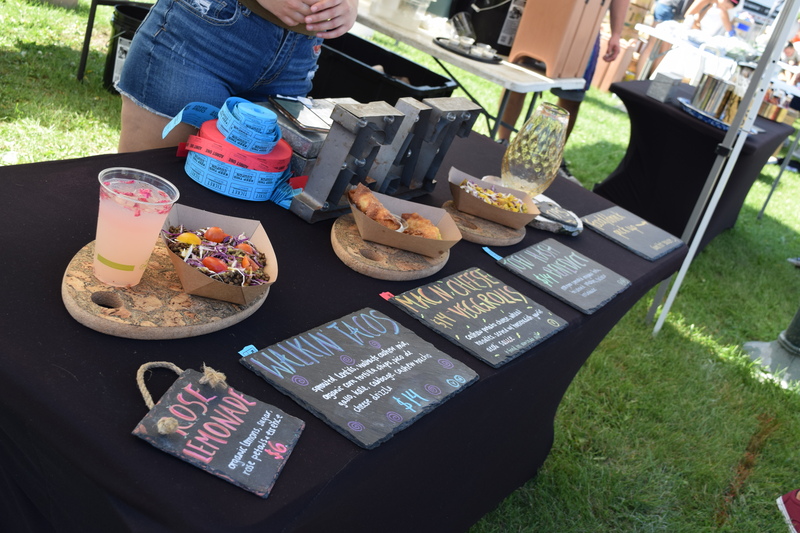 Attending the Plant Based Showcase is free, but all of the vendors are selling food or goods. Cards are accepted but cash is preferred. Compassionate Action for Animals is a proud co-sponsor of the event. 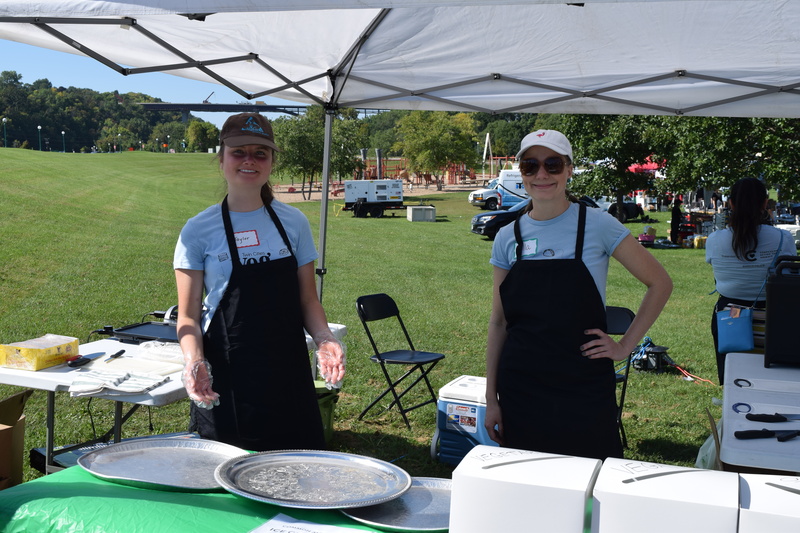 Volunteers are needed to help staff the CAA table. If you’d like to help out, please contact laura@exploreveg.org. Invite your friends and keep up-to-date on the Facebook event page. 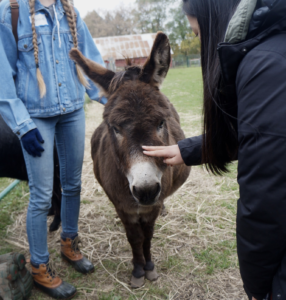 On Saturday, October 13th, U of M students and other CAA community members had the exciting opportunity to tour SoulSpace Farm Sanctuary and interact with their residents. SoulSpace Farm Sanctuary is in New Richmond, WI. 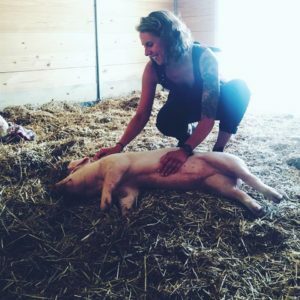 Located about 45 minutes from Minneapolis, SoulSpace is a local farm sanctuary doing the crucial work of rehabilitating farm animal rescues and educating their surrounding communities about the impact of industrialized animal agriculture. Upon arrival, the visitors met Kara Breci, founder and executive director of SoulSpace. 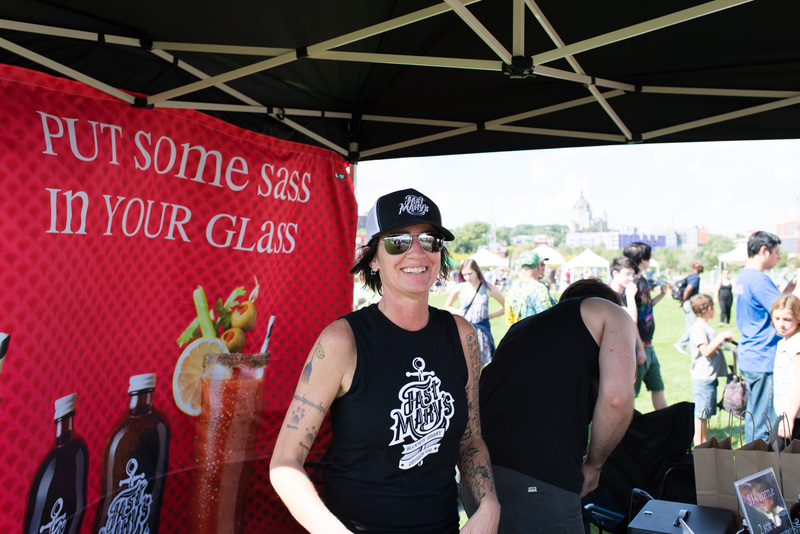 Kara founded SoulSpace about three years ago after retiring from the St. Paul Police Department due to an injury. Since its start, the sanctuary has grown to house 45 rescued farm animals and be supported by over 100 volunteers. 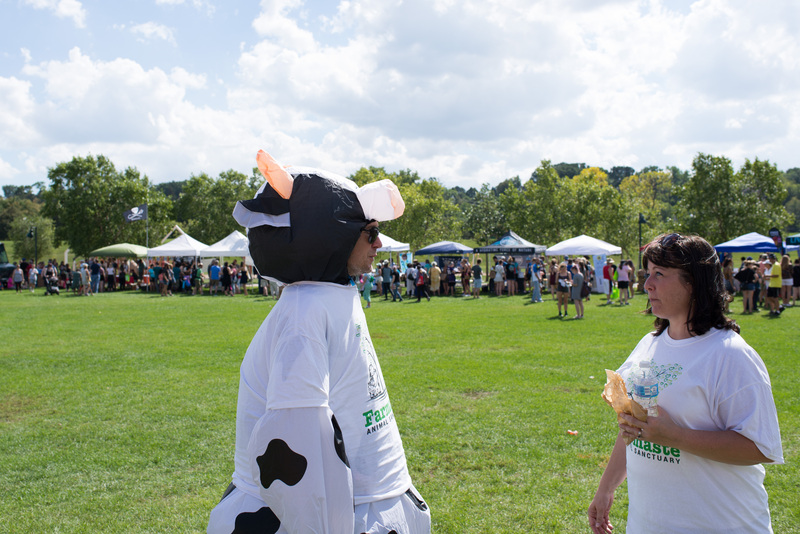 Each year, the sanctuary hosts a number of events to raise awareness about cruelty against farmed animals and to show others how to live in a more compassionate way. Kara led the group around the facility to meet some of the sanctuary’s 45 animal residents. Each one has a unique story, which Kara was delighted to share with the visitors. The tour met London the pig, whom Kara described as the “sassiest resident,” and Frederick the sheep. Frederick spent the first three months of his life in a trailer with a litter of puppies. All were so neglected that the puppies chewed off one of his ears. Today, Frederick loves to eat bananas and still thinks he’s a dog instead of a sheep. Visitors also met Wally, another one of the sanctuary’s rescued pigs. 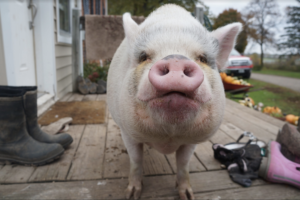 Wally made headlines about 19 months ago after jumping out of a truck headed to a slaughterhouse in South Dakota. Luckily, Wally did not suffer any major injuries and is now very happy in his new home at SoulSpace. Throughout the tour, Amos, a 24-year-old donkey curiously followed the group around the sanctuary. In his younger years, Amos was forced to give rides to children and later became a companion animal. Today, he enjoys taking selfies with visitors at SoulSpace. The group encountered many more animals as well, including hens, roosters, peacocks, ducks, turkeys, dogs, and a cat. Kara explained that each animal has their own personality, and often surprise people with how friendly and affectionate they are. At the end of the tour, Kara explained that the goals of the sanctuary are to educate others about cruelty against farmed animals and to encourage individuals to make more compassionate choices. 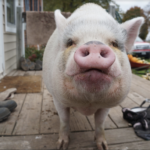 Kara and the SoulSpace residents aim to show their visitors that farm animals have a lot in common with some of the more familiar companion animals and hope that this will encourage people to consider more closely the impacts of their food and lifestyle choices. One of the most amazing things about this sanctuary is how friendly and loving all the animals are. 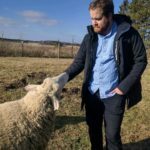 Each one was ecstatic to receive visitors, which shows that farmed animals have much more in common with companion animals than most people think. Each day, sanctuaries like SoulSpace receive housing requests for newly rescued animals. As it currently stands, there is not enough sanctuary space to give care to all of the animals that need it. The more people that are aware of this issue, the more support the sanctuaries will receive, and others will begin to spread the message of compassion toward animals. Right now, sanctuaries need our support. SoulSpace and other spaces like it prove that education and compassion really do make a difference in the lives of their residents, visitors, and the billions of farmed animals currently living in abusive and inhumane conditions. SoulSpace Farm Sanctuary hosts tours every Saturday along with camps, volunteer workdays, and many other events. Visit soulspacesanctuary.org for more information on how SoulSpace is continuing their quest to save farmed animals from cruelty. 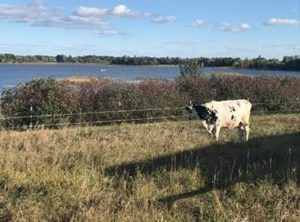 Meet Mark Opsahl and Dini Pederson-Opsahl, the owners, co-founders, and operators of Anna Lake Animal Sanctuary, Minnesota’s newest farm sanctuary. Located in Underwood, MN, the sanctuary is devoted to providing a caring home to their residents through rescue, adoption, and education. 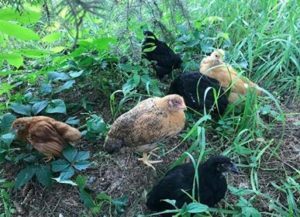 Established in 2017 as a microsanctuary, Anna Lake Animal Sanctuary quickly grew in size and is now home to 18 chickens, 6 ducks, and 3 cows. 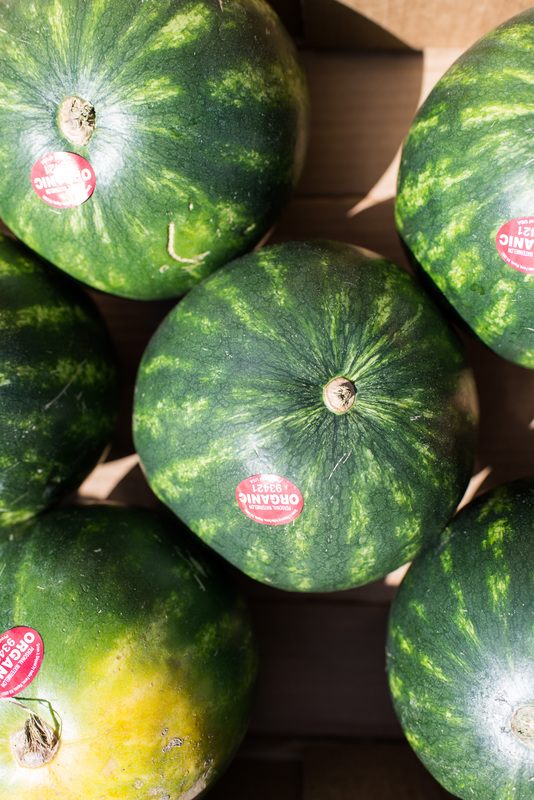 Mark and Dini strive to honor their grandparents while evolving the lessons they learned from them––Dini was raised in Minneapolis by her grandparents, while Mark was raised in a farming community. Dini’s grandmother was the first female animal control officer in the United States and an active advocate for marginalized and underrepresented groups in the country while Mark’s grandfather and father were both lifelong farmers. 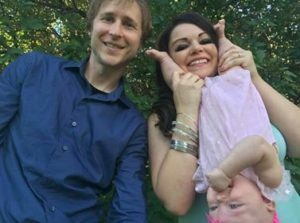 Mark and Dini became vegan shortly after moving back onto his family’s farm. “I always wanted chicken companions, and I told him let’s get some chickens,” said Dini. 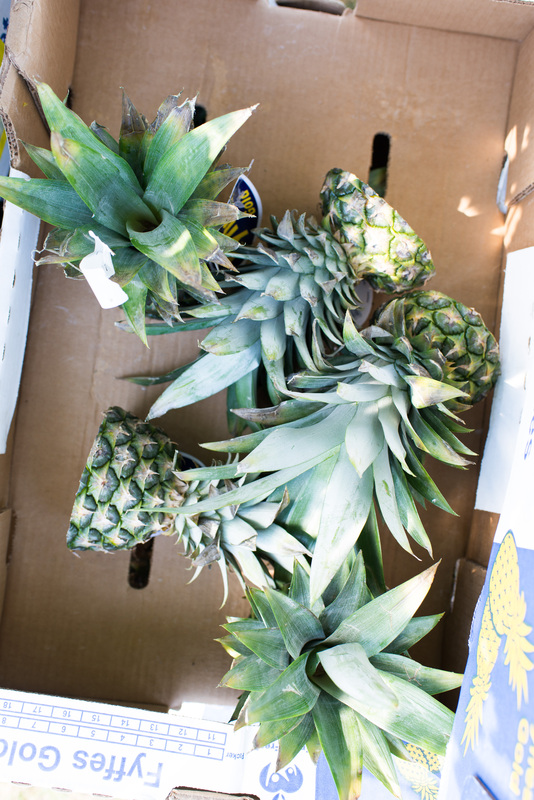 She quickly went vegan after adopting the chickens, recalling, “Once we got them and fell in love with them, it didn’t feel right that we were eating chicken.” Mark went vegan shortly after her. They began to look for additional opportunities to help farmed animals, which lead them to explore expanding the work they were already doing––to provide a safe living and rehabilitation space for more animals. They decided to honor and evolve their family’s legacies, continuing the farm in Mark’s grandfather’s name and giving it a new life and purpose as Anna Lake Animal Sanctuary. Starting a sanctuary has not been without its ups and downs. They’ve received some pushback from local farmers and family about starting a sanctuary in Underwood. Starting small adds up to a big difference, especially for the lives of rescued animals who no longer live their lives in constant fear and pain. The sanctuary’s grand opening is this Saturday, October 20th from 12:00pm – 3:00pm. 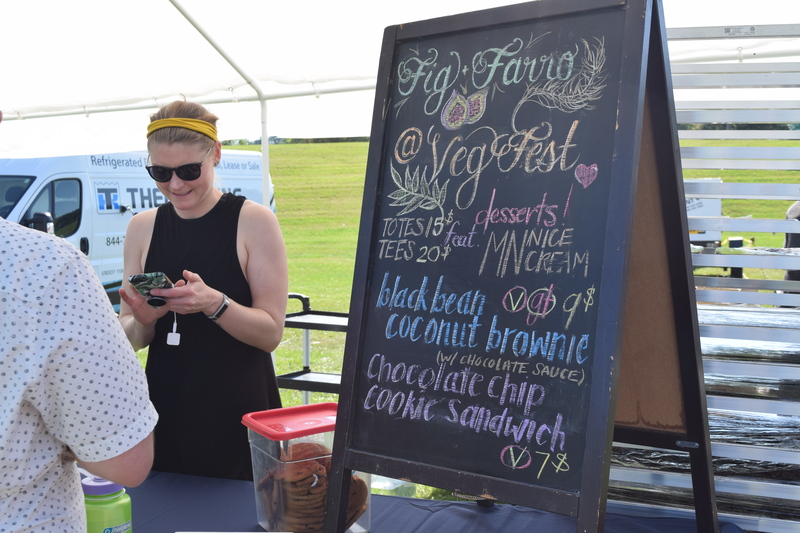 They’ve invited up a number of vegan Twin Cities-based businesses as well as some local to Underwood that are willing to try their hand at veganizing some fall favorites. Admission is free, donations are appreciated. All donations made will go directly towards supporting their residents this winter. 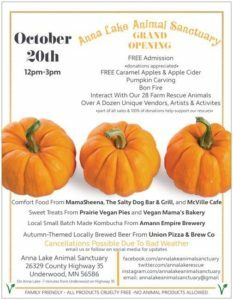 Anna Lake Animal Sanctuary is located at 26329 County Highway 35 in Underwood, MN 56586. For more information, visit their Facebook event page or their website. CAA welcomes Lucia Skinner De Gregorio to our board of directors. Learn more about Lucia and how she got involved with speaking out for animals and CAA below. 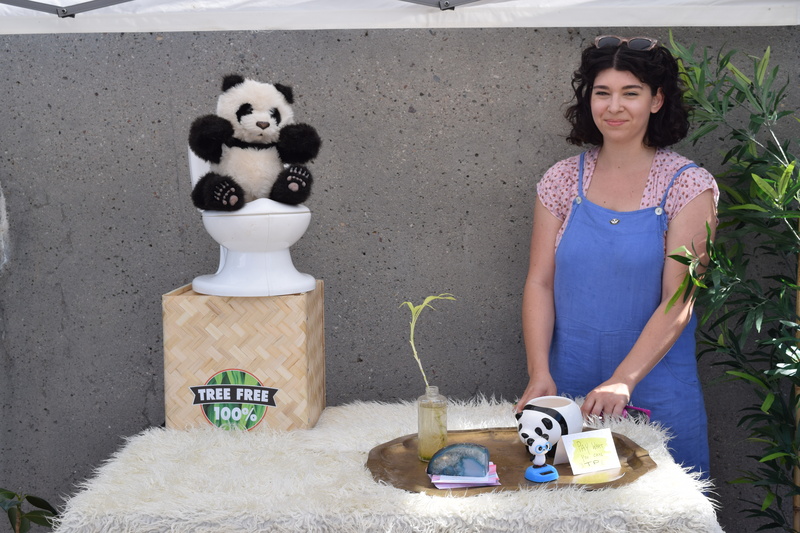 Lucia is passionate about raising awareness about the cruelty and injustices perpetrated against nonhuman animals. With a spirit of ethical stewardship and service, Lucia hopes to work toward inspiring a more empathetic and mindful society. In her past board role with MN Women’s Consortium, she focused on outreach and strategy and served on a special committee alongside their Executive Director focusing on the development of the Young Women’s Advisory team and organizing their meetings. Lucia has also been an active volunteer at Spring Farm Sanctuary. She initially became involved with them as a farm hand. She is now a tour guide and part of their marketing team. 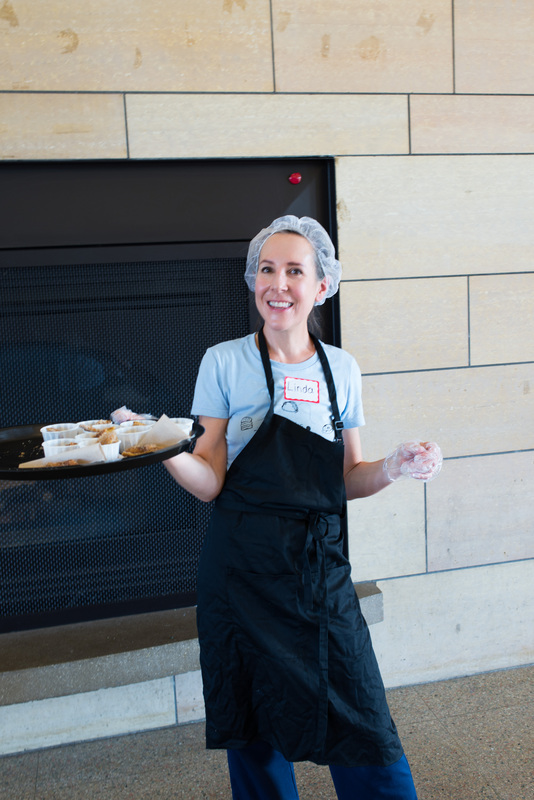 She also has event planning experience and is excited to become more involved with the Twin Cities animal advocacy community! Raising awareness in the general public about animal cruelty is certainly high on the priority list. Lucia believes that one of the largest obstacles the animal advocacy movement faces is speciesism or the idea that humans are inherently more valuable than any other species, and that awareness itself of the violence perpetrated against nonhuman animals does not necessarily guarantee change. Speciesism has brought about the devastating degradation we have inflicted on our planet and on other living beings. “I’ve always viewed the endeavor to resolve injustices to be one best attempted by treating a problem at its source. To me, the injustices we experience within our own species (racism, sexism, heterosexism, classism, etc) are problems built upon the foundation of hierarchical thinking, which is embedded in our cultural––referring specifically to Western/American here––psyche in the shape of humans being inherently superior to non-humans,” said Lucia. “I genuinely believe that if we can humbly and lovingly spread the word that we humans are a part of, rather than apart from nature––we can begin to see a shift in our treatment of said nature. 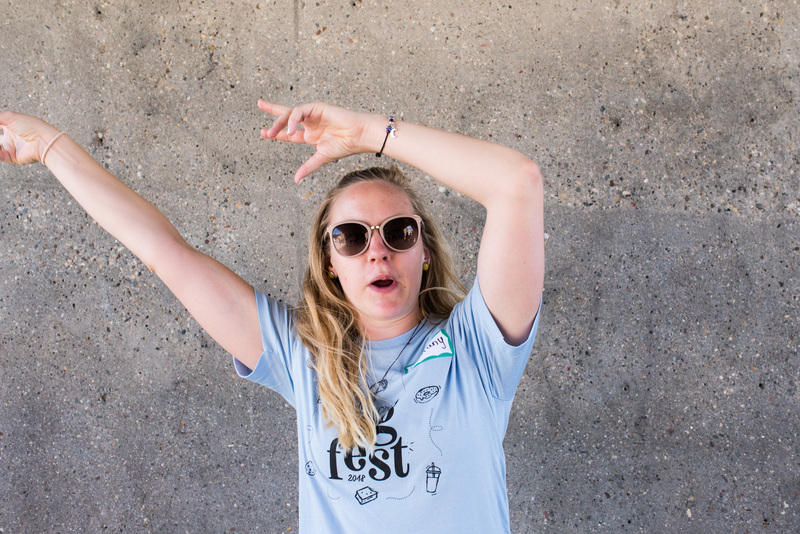 Lucia loves connecting with others, building community and mutual support, and bridging divides through humility, empathy, and love. Her greatest desire is to do work that protects and defends animals, and she believes that her life’s trajectory will reflect a pursuit of that. She cares deeply about intersectional thinking and recognizing that the inequalities and injustices we know within our own species are deeply interconnected with those which exist at an interspecies level. 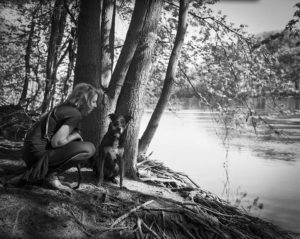 In her free time, Lucia enjoys writing and spending time with Mona the dog. We are thrilled to have Lucia serving as our newest board member. 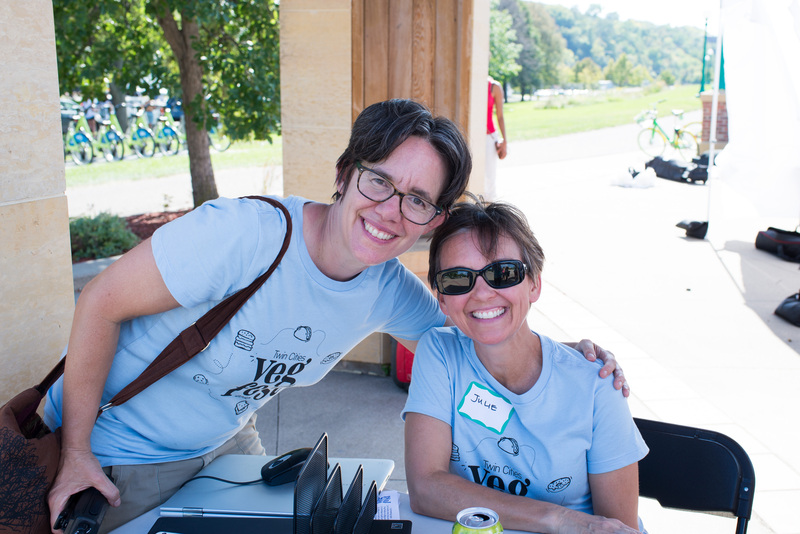 If you see her at an upcoming outreach or community event, be sure to say hello! 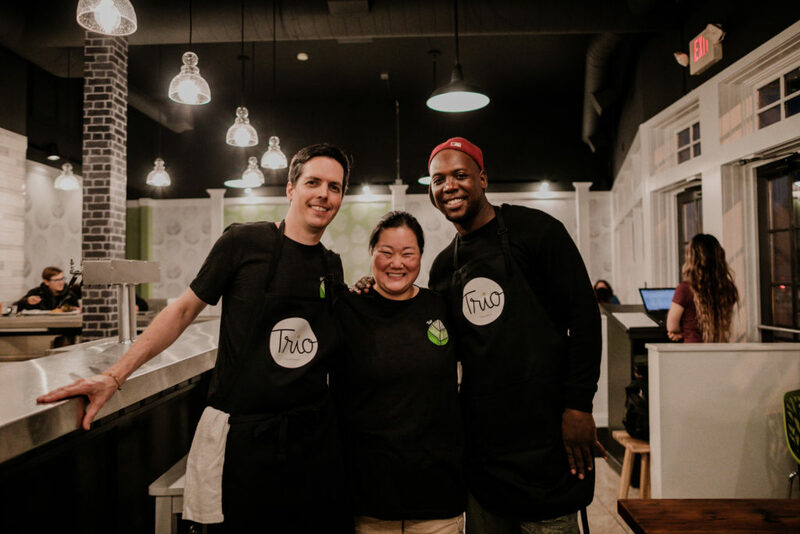 After starting out with pop-up sales featuring their takes on lasagna, mac and cheeze, burgers, ranch dressing, and more in 2017, Trio Plant-based moved into their space at 610 W Lake Street in Minneapolis to start serving up plant-based comfort food daily this September. Founded by Louis Hunter and Sarah and Dan Woodcock, the new plant-based restaurant is featuring a grand opening menu that includes comfort food classics like Grilled Cheeze with Tomato soup, House Salad with Trio Ranch, Spaghettrios (their veganized take on SpaghettiOs), and other mouth-watering choices. 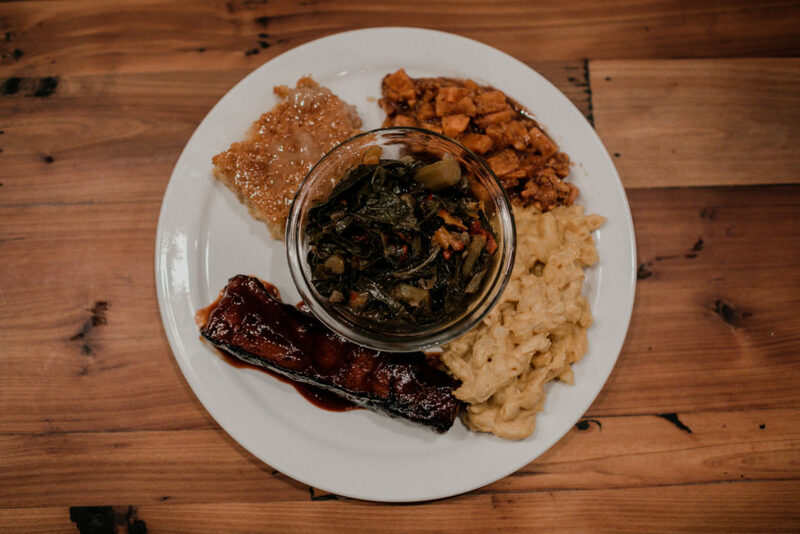 Aside from deli ham and ribs from the Herbivorous Butcher, everything Trio has on their menu is house-made. 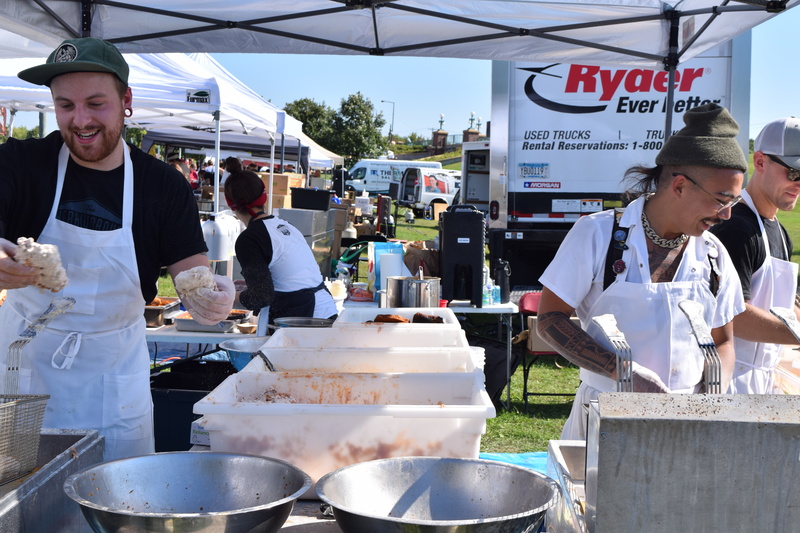 The trio used their pop-ups as a testing ground to find out which dishes to serve at their restaurant and also hired on a number of people who helped them during this time to continue working at their permanent location. 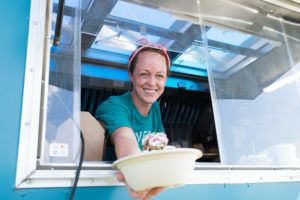 If you asked Dan and Sarah if they were working toward opening a restaurant a couple of years ago, you would have likely gotten a ‘no,’ but not from Louis, who had been interested in starting a food truck. 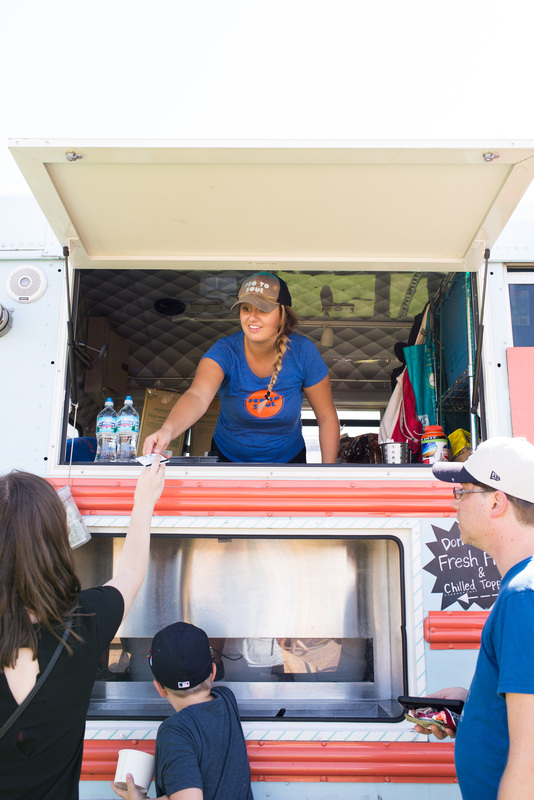 “A restaurant was never on my radar,” said Sarah of their start. The three met in 2016 while fighting charges Louis was given after attending a Black Lives Matter protest for a black man who was murdered by the police. 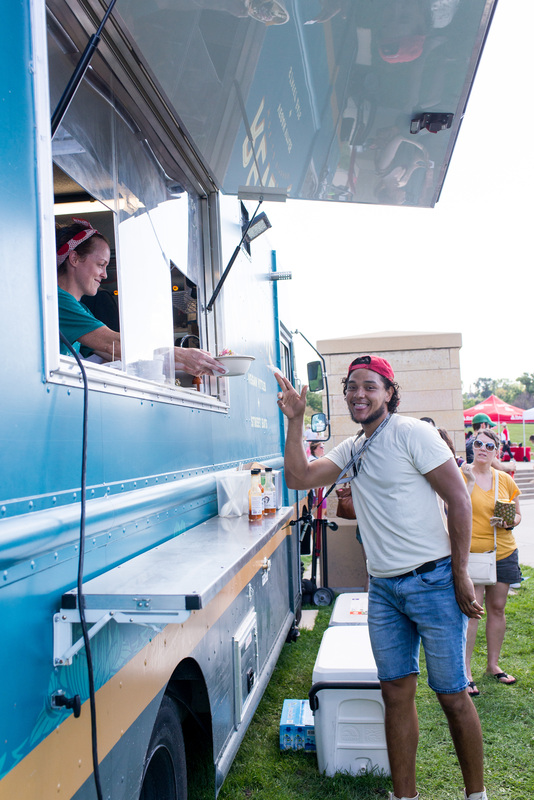 After the charges were dropped, three decided to build their futures together to open Minneapolis’ first plant-based restaurant owned primarily by people of color. The team ran a very successful Kickstarter campaign to get their business started, raising over $10,000 more than their $50,000 goal with 600 individual backers from around the world. Behind the counter at their restaurant, they have a column that recognizes some of their Kickstarter backers. 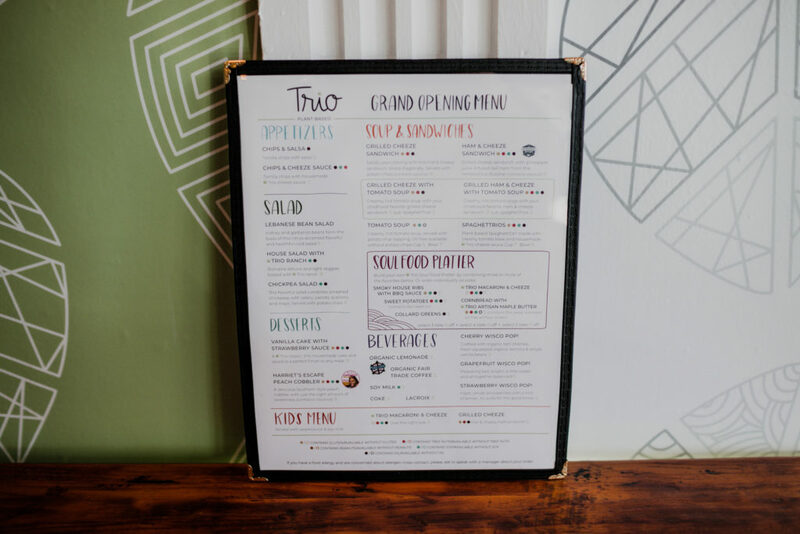 Together, their restaurant reinforces that plant-based food is for everyone and that you do not have to be vegan to own a vegan business. 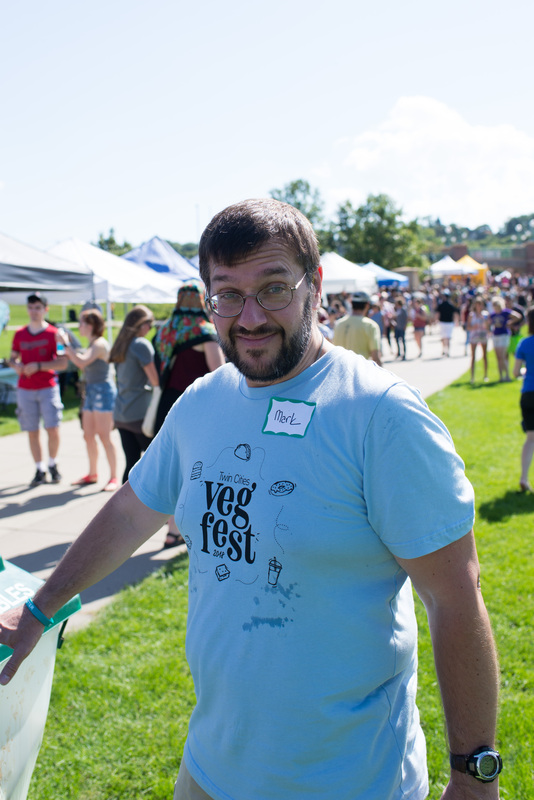 (Dan and Sarah have been vegan for over 6 years while Louis is not––but eats a lot of plant-based foods and confirms when a new veganized dish is a hit.) 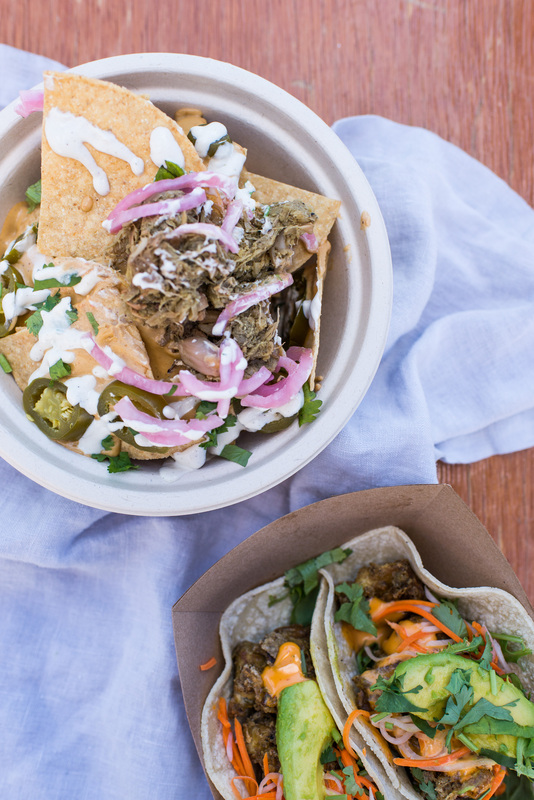 They look to serve the intersecting plant-based, plant-curious, and foodie communities alike. 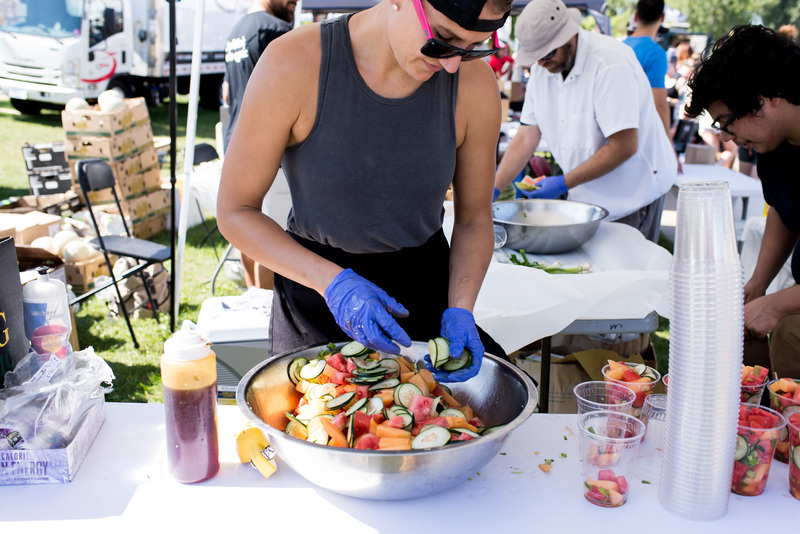 “The commitment to the principle of veganism is the same and it’s just a matter of welcoming people to explore the concepts, learn that plant-based eating can be nutritious and delicious, and getting people comfortable with the type of cooking and meals and to know that you can be full and happy [after a vegan meal],” said Sarah of their business. Their current hours are 5-10pm Sunday through Thursday nights and 5-11pm Friday and Saturday nights. 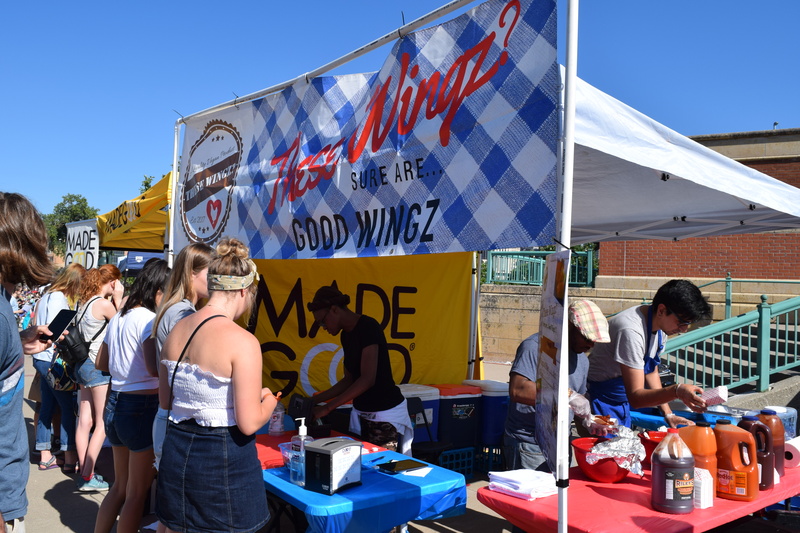 They are open for to-go orders as well and plan to add lunch, breakfast, and beer and wine service in the future. 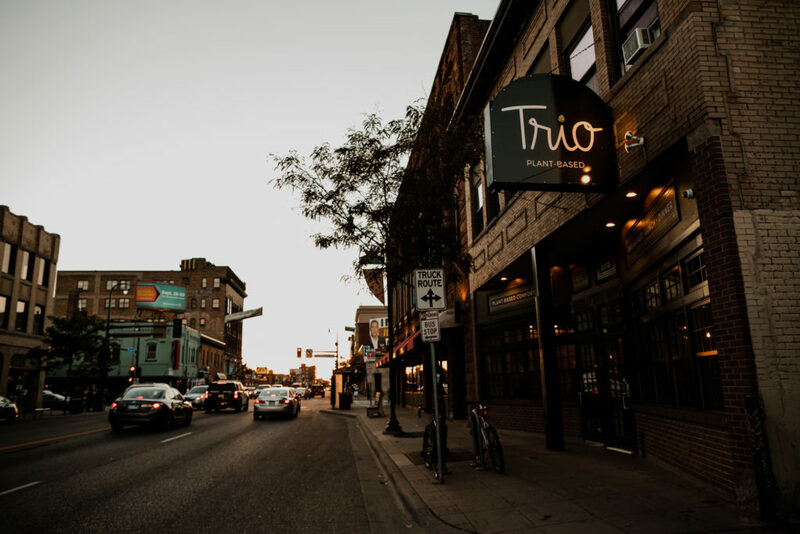 Check back on their website for more updates about their open and keep a lookout on our events page for a dine-out at Trio! 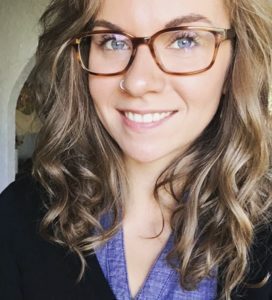 Meet Haley Hastings, the president of the Compassionate Action for Animals student group at Augsburg University (also known as CAA Augsburg Vegan Club). 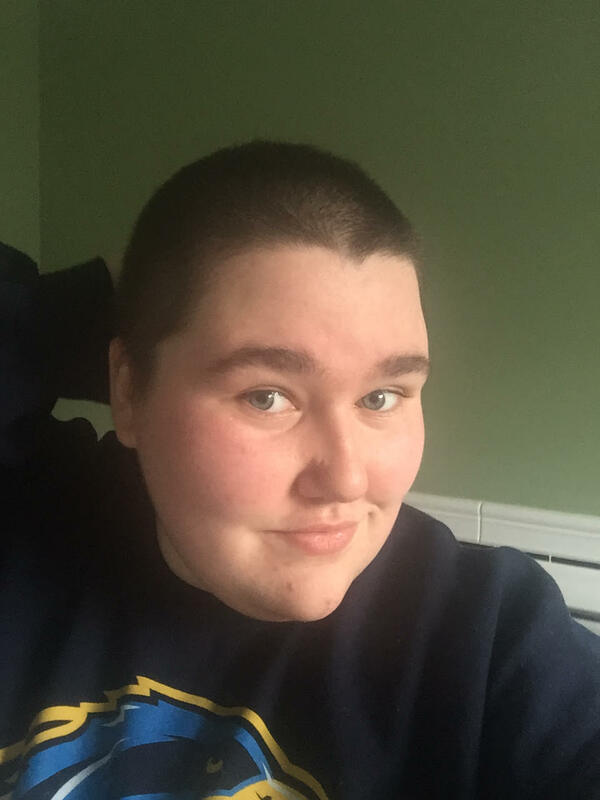 Haley is a Gender, Sexuality, and Women’s Studies major from New York state working towards graduate school in social work. When she’s not advocating for animals, you might find her gardening or playing Dungeons and Dragons. Haley found out about CAA through the Augsburg chapter last summer. 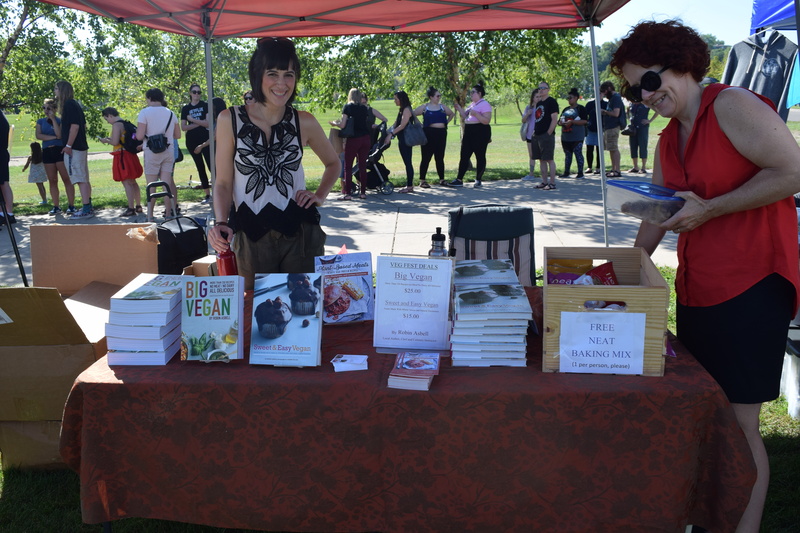 After being vegan for seven years, she was drawn to joining the group by more opportunities to be a vegan activist. “I’d never really done any activism besides telling my friends and family about what happens in farms, so it seemed like a really good way to make a difference in something that really mattered to me,” said Haley. As president of the new chapter, Haley is focused on growing the group this year and increasing awareness and recognition of the club. 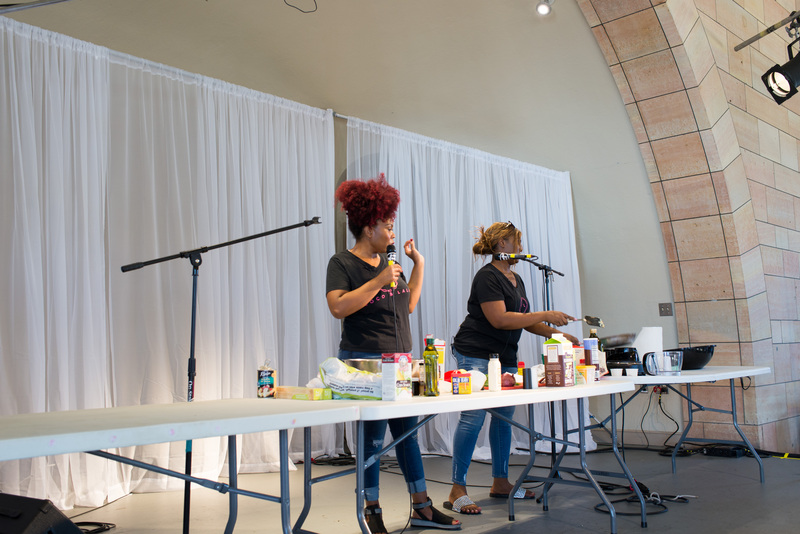 The group plans to focus on a few key events this semester in addition to an ongoing discussion about adhering to a vegan lifestyle, including food giveaways around Halloween and finals week. 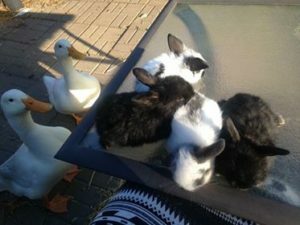 They also are looking to organize a fall farm sanctuary trip. The Augsburg group was formed spring 2018. 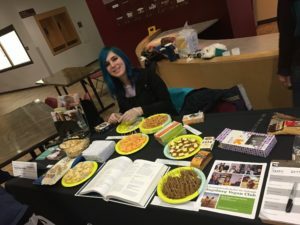 Its tight-knit group ties their veganism back to the animals and invites all (vegan and non-vegan alike) who are curious about plant-based living and animal rights. 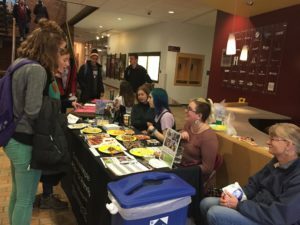 This spring, they plan to become involved with the Augsburg Environmental Fair and increase their presence at other campus events. 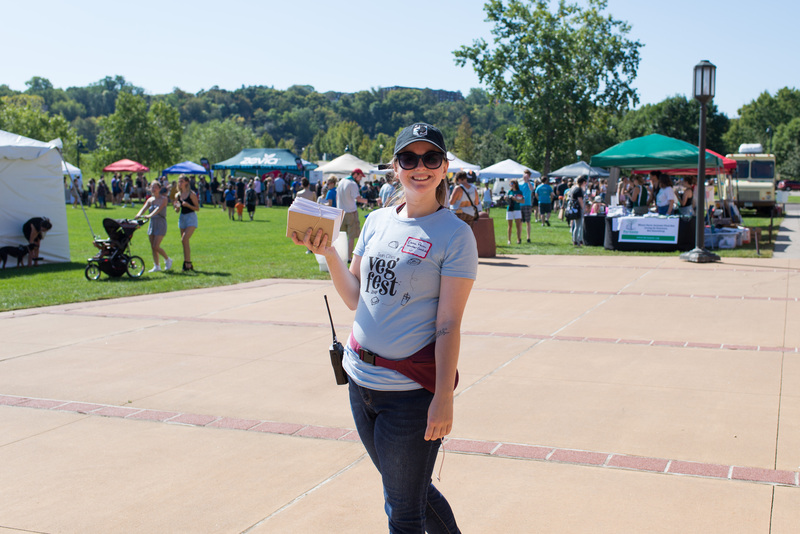 Haley looks for opportunities to connect the Augsburg group with other CAA events and volunteer opportunities outside their chapter. 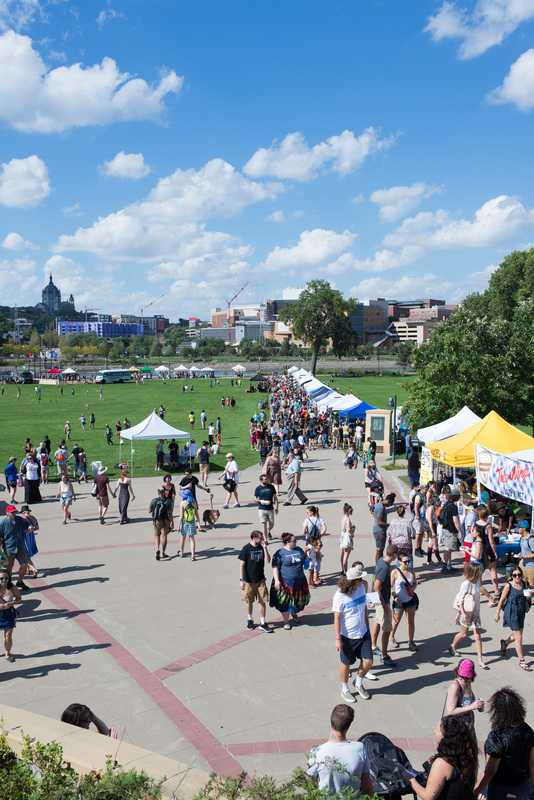 If you’re a college student in the Twin Cities looking to become involved with one of our CAA student groups, visit our campus page to learn more. (High school students are welcome, too!) Weekly meetings have started up for this fall semester, and we have other upcoming volunteer opportunities listed here. 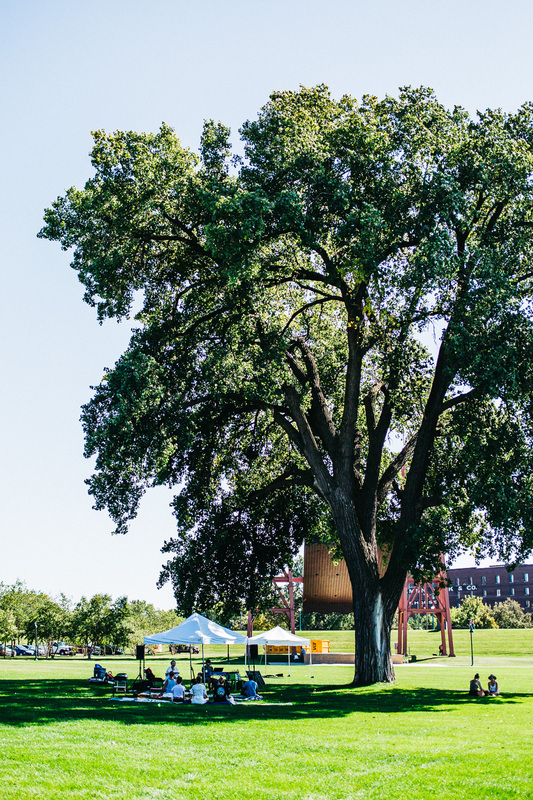 Fall on Campus: What’s Going On? Compassionate Action for Animals (CAA) is fortunate to have not one, but two student chapters in the Twin Cities. 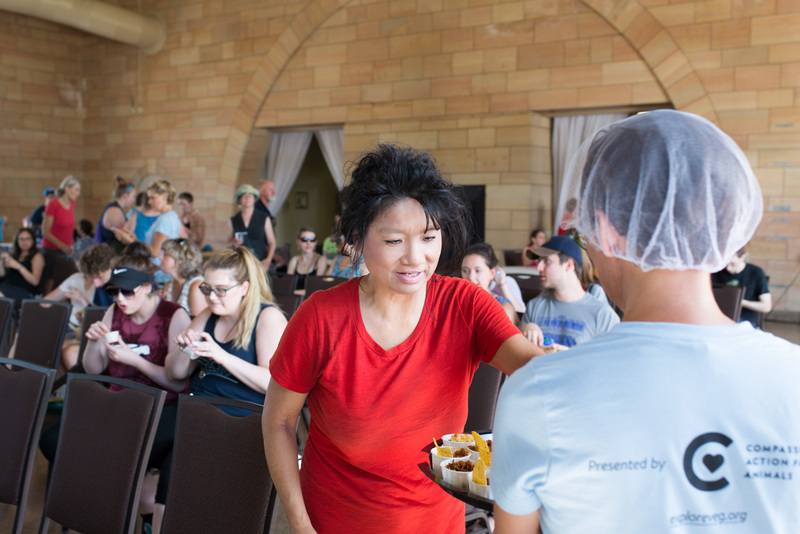 The chapters at the University of Minnesota and Augsburg University campuses have fast become hubs for more peer-to-peer advocacy. 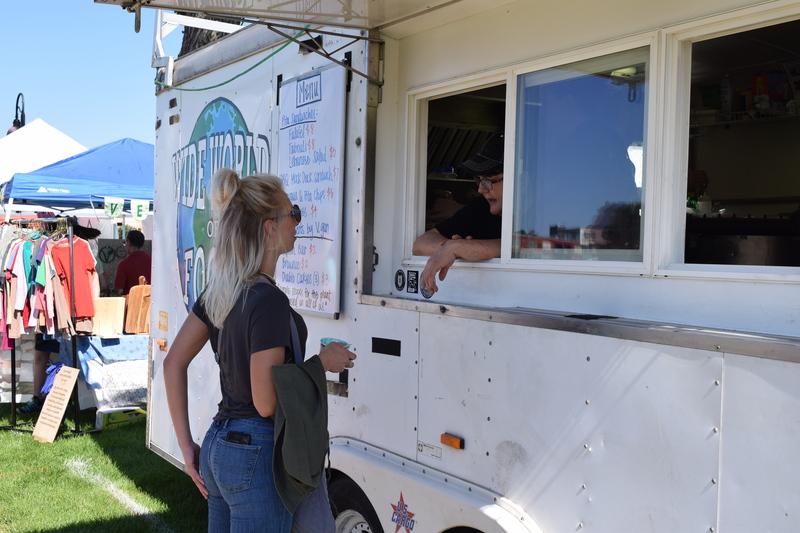 Fun fact: the two campuses happen to be anchored around the Hard Times Cafe, a local vegan and vegetarian restaurant. 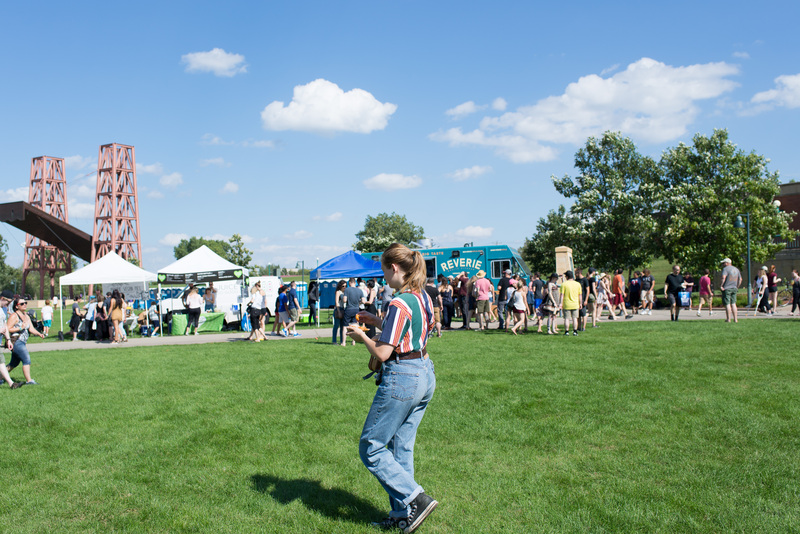 We connected with Marina Kirkeide, chair of the University of Minnesota chapter and Haley Hastings, chair of the Augsburg University chapter to learn about how their groups are doing and what they have planned for this fall semester. 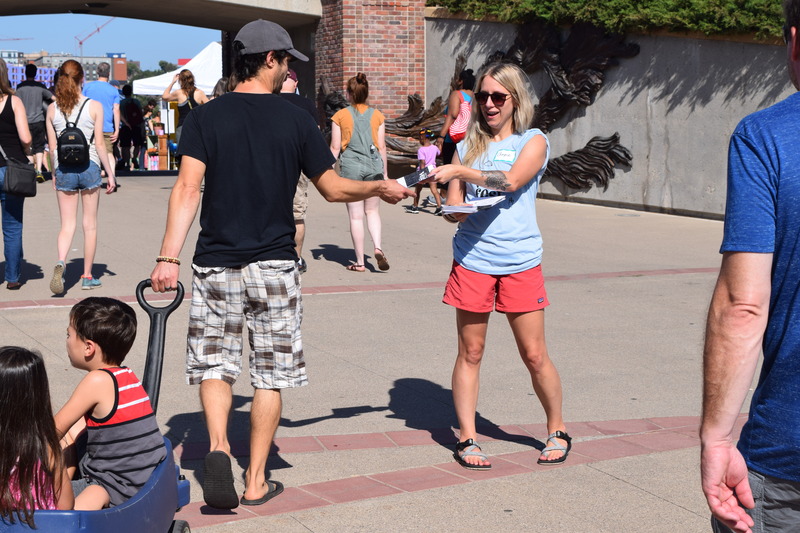 The Augsburg group is newer than the University of Minnesota group, having started spring 2018. 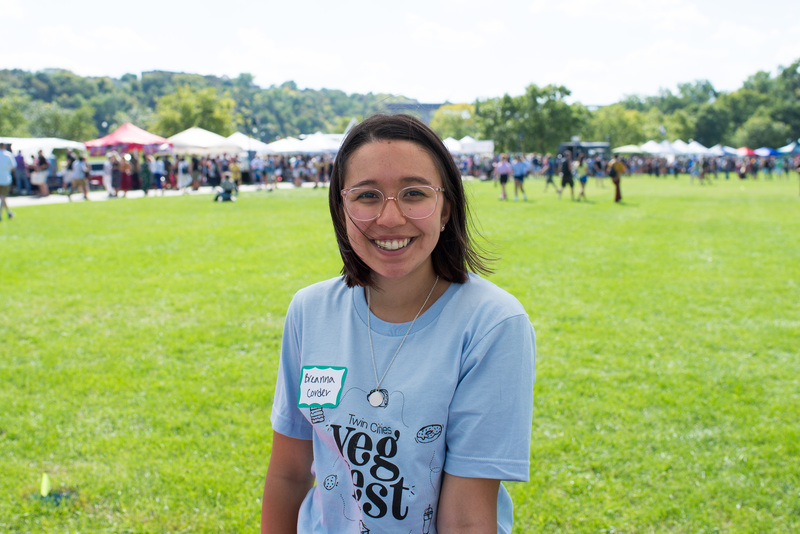 “One member of my group felt very isolated because she didn’t know any other vegans before coming to the club,” said Haley. 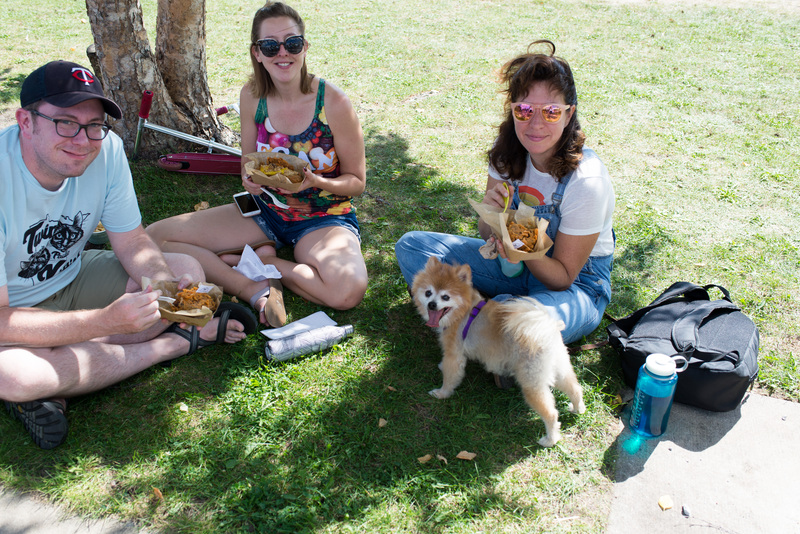 “It’s good to have a sense of community.” Members of the small but strong group went vegan for the animals and invite all (vegan and non-vegan alike) who are curious about plant-based living and animal rights. 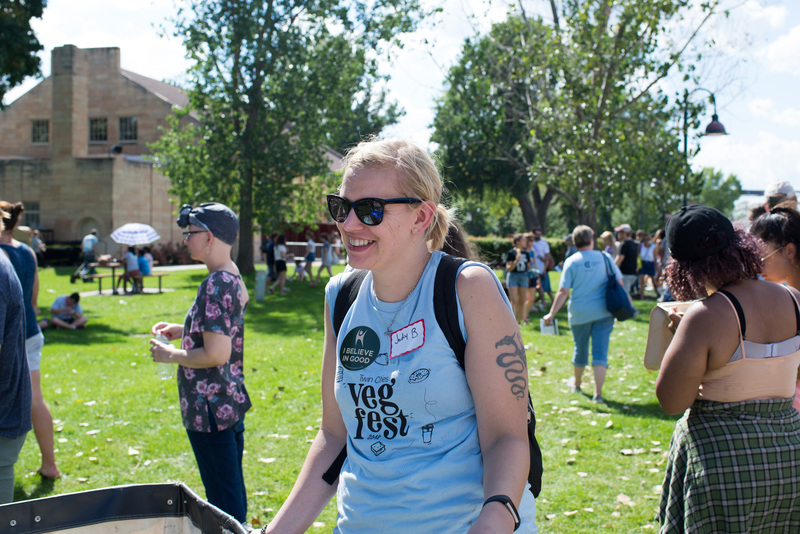 Both prioritize making their groups a safe, inclusive space for all members to learn, grow, and explore compassionate, plant-based living together in their roles as chapter chair. 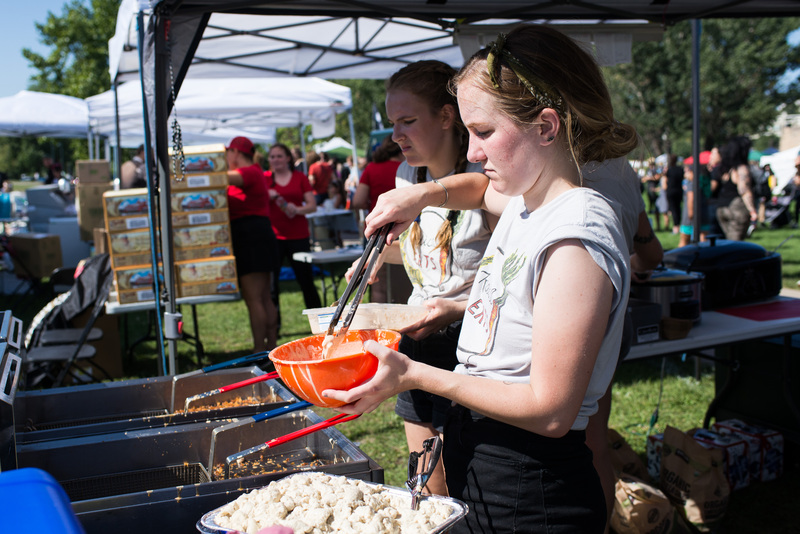 In the past year at the University of Minnesota, the biggest change has been that meetings have become a lot more focused on activities for students and less on the planning of events. The majority of the planning is instead done by students in leadership roles, enabling other members to focus on being present at their advocacy events. The existence and growth of the two groups indicate an exciting shift toward more people practicing compassionate, plant-based living. Students doing peer-to-peer advocacy create events that end up reaching more folks, contributing to a larger future impact. We are grateful for our student chapters and the work they do! 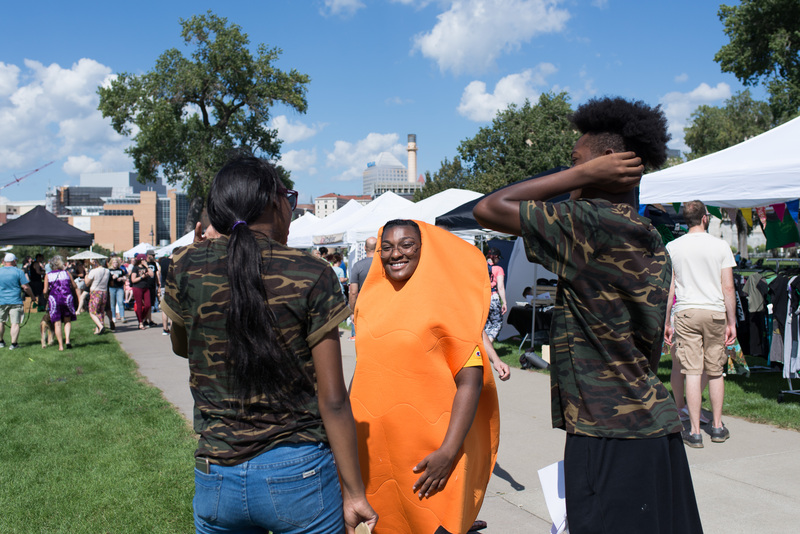 If you’re a college student in the Twin Cities who is looking to become involved with one of our CAA student groups, visit our campus page to learn more. (High school students are welcome, too!) Weekly meetings have started up for this fall semester, and we have other upcoming volunteer opportunities listed here. 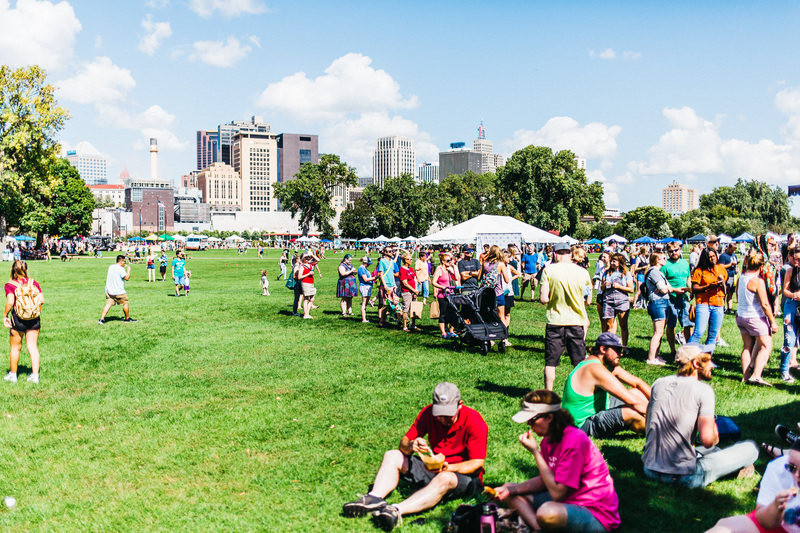 These are some of the numbers that describe the 2018 Twin Cities Veg Fest. 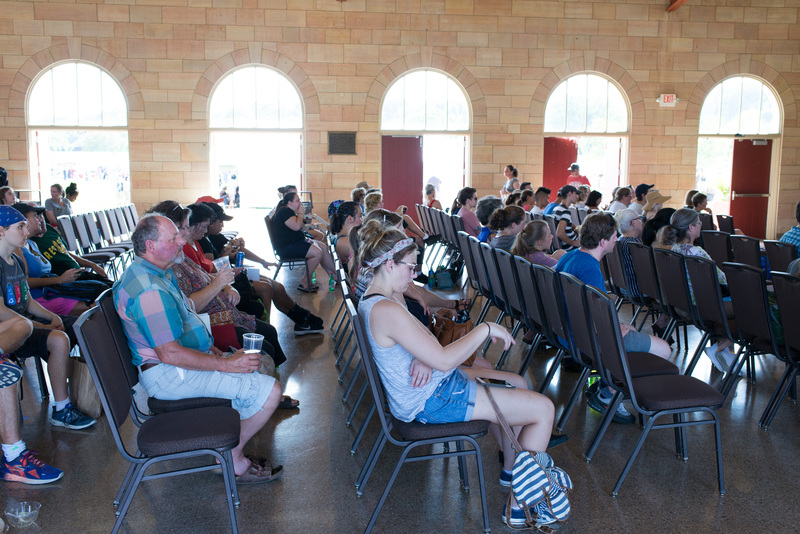 This year’s festival was full of thoughtful presentations, exciting conversations, performances, and delicious food. Numbers are great, but a picture is worth a thousand words. 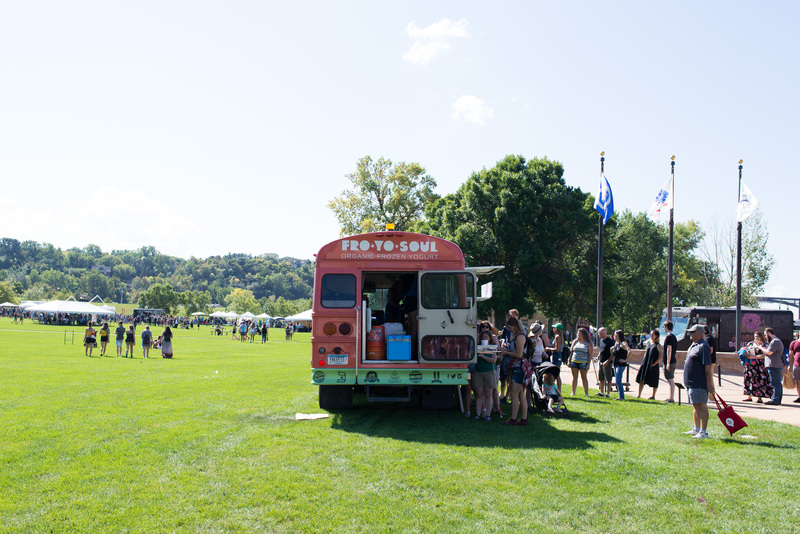 Luckily, we’ve got a ton of pictures to show you how we Twin Cities Veg-Fested. 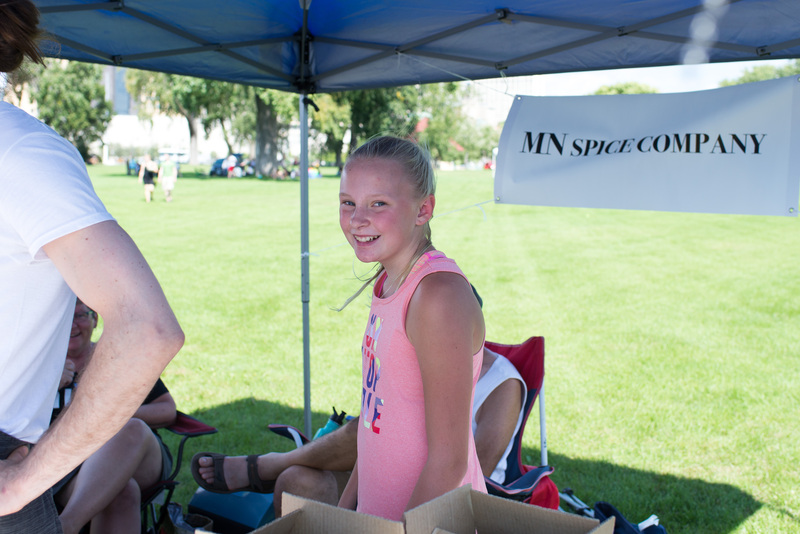 Special thanks to our awesome volunteer photographers! 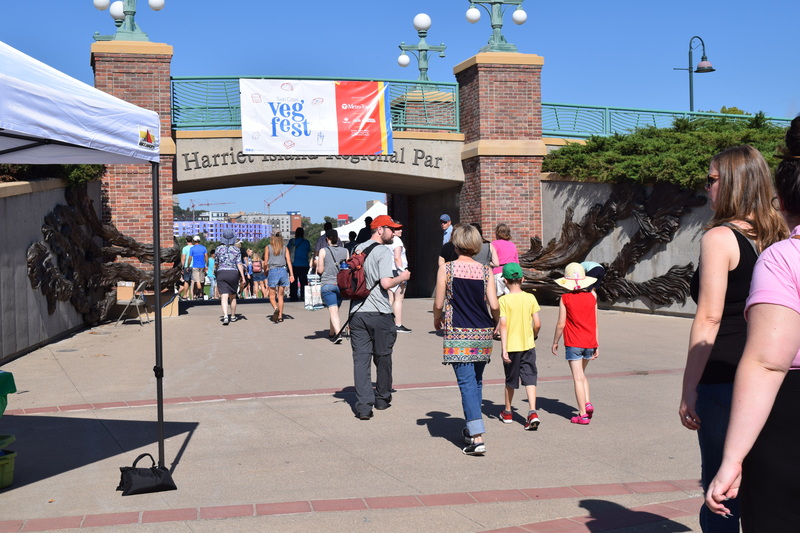 To see even more photos from Sunday (or share some of your own! 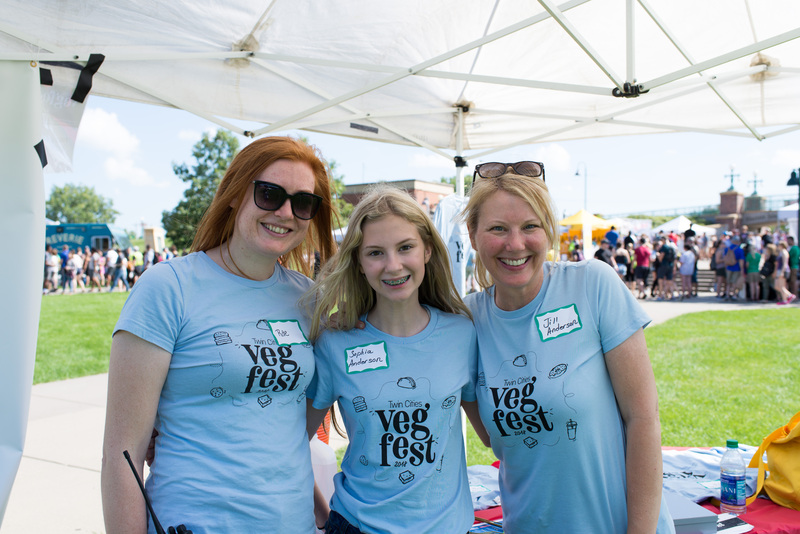 ), check out our Instagram feed and search for photos with the hashtags #tcvegfest or #tcvegfest18.